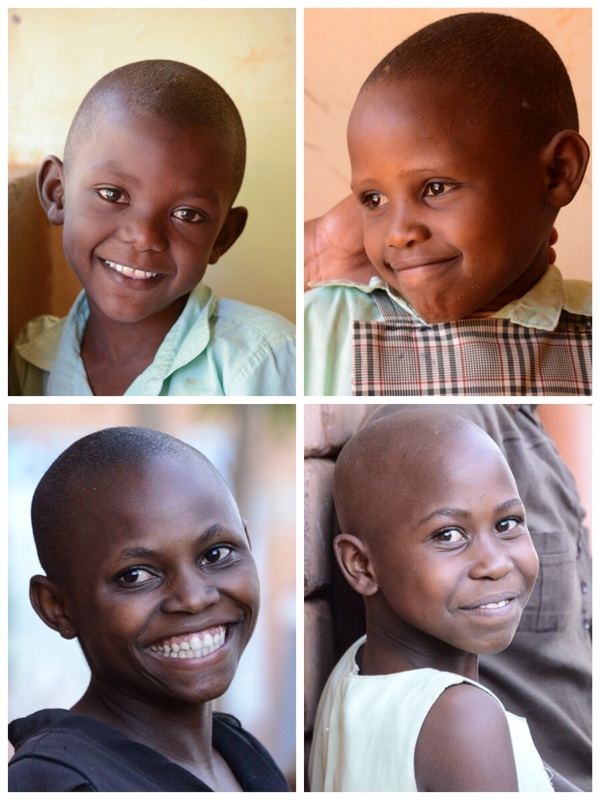 Zuri watoto wote is how you say “all the beautiful children” in Swahili. 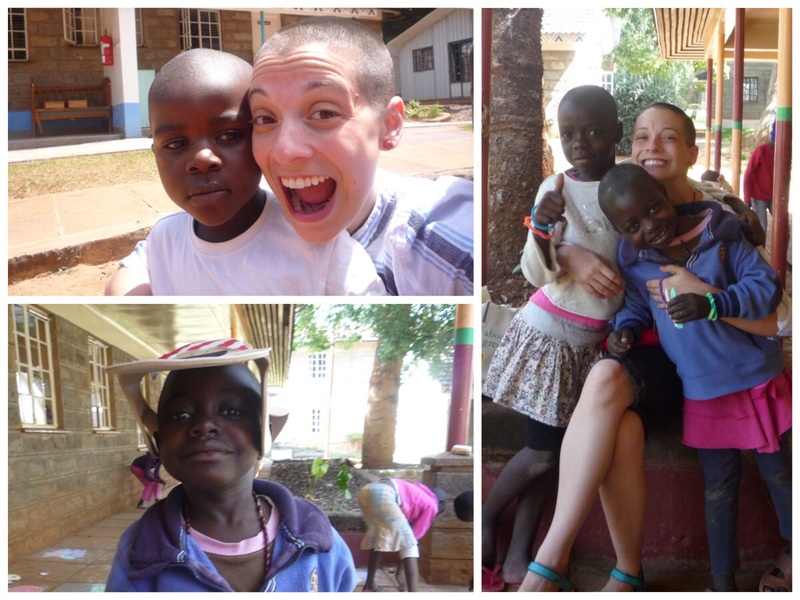 This photo is from the Nyumbani website, www.nyumbani.org , where you can go to see the programs that Nyumbani has for HIV+ children in Kenya and the sites where we will be volunteering. 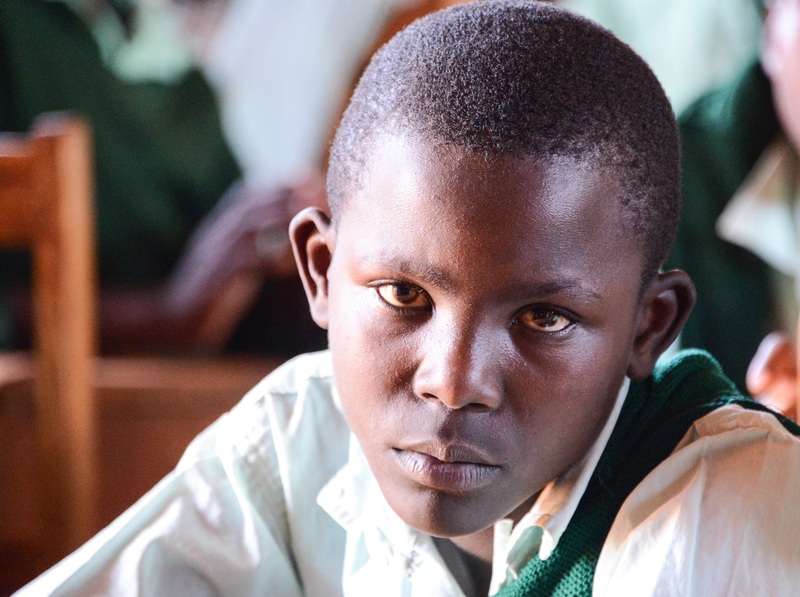 There are over 15 million children who live in sub Saharan Africa who have been orphaned because their parents have died of AIDS and over 2 million children have HIV/AIDs. 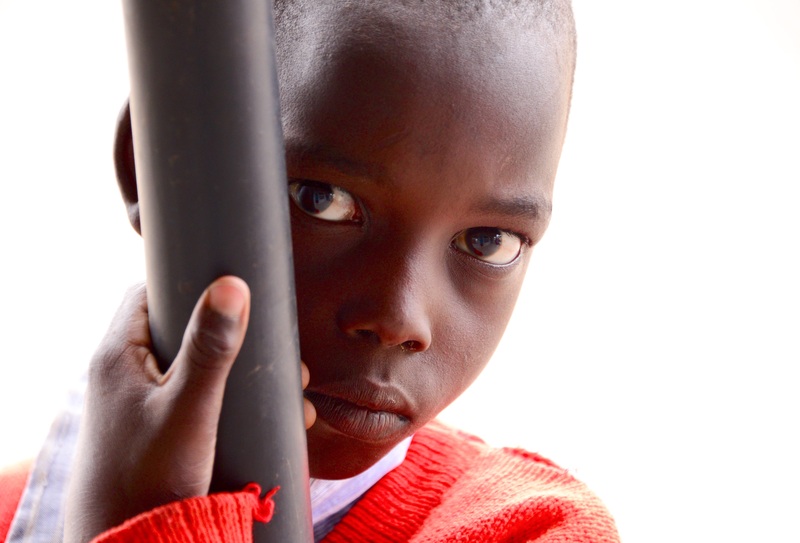 Over one and a half million AIDS orphans live in Kenya. 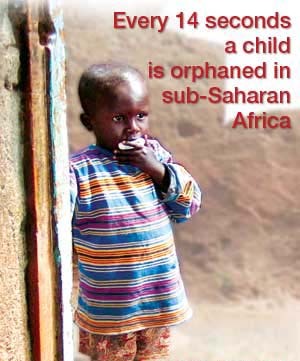 It is estimated that by 2010 one third of all the children in Africa will be orphaned due to the AIDS epidemic. When they first arrived, Denzel and Wycliff presented all of us with a letter from each which also had earrings and a magnet in the envelope, and each of us a beautiful bouquet of roses. I was so moved by their presentation and simply meeting all of them that it brought me to tears. We visited for just a bit before we set off to buy lunch and to get on the road to Lake Navaisha. In celebration of the occasion, we had ice cream before we ate our lunch. The ride was quite beautiful along the Rift Valley. And arriving at Lake Navaisha was equally as beautiful! We then boarded the boats for the hippo safari, a tour through the beautiful lake teaming with birds and other wild life, including, of course, hippos. I wasn’t nearly as impressed with the hippos as I was with boat ride itself since the water was full of vegetation and so many birds. It felt like we were going through the bayou for part of the ride. A sampling of the birds we saw. As we got out further from the shore, the guides pointed out the African Fish Eagle and threw a fish up into the air so it would take flight. Following our foray with the birds, the boats picked up pace and brought us over to Crescent Island. The island is actually the site where “Out of Africa” was filmed and originally did not have any wildlife. All of the animals that are there were initially brought over and remained, but the lion was brought and then removed. We ate our lunch on the island which was very beautiful and then began a walking safari that was so incredible because we were so close to and amongst the animals. We first encountered encountered many zebras. Although we weren’t quite close enough to pat them, we got within 30 yards of them. You may notice that there are some young ones in the group. They were born 3 and 4 months earlier and we had the opportunity to see them playing, frolicking, and even nursing. The zebras, including the cute young ones. Many other animals were sited, including a giraffe that was just 4 days old! We saw many other animals while on the walking tour of the island, but the best part of all was spending time with Justus and his family. We were there all afternoon, managed to avoid the thunderstorm that was happening in the distance and enjoyed a cool breeze which made it much more comfortable to be there. We headed back on the boats in the midst of different scenery now that it was later in the day. We did not get into the van to head home until appropriate group pictures had been taken! The ride home along the Rift Valley was a whole new vista, just as beautiful as earlier, but different as the sun was going down. When we arrived back at Dimesse Sisters Retreat, that rascal Justus had something up his sleeve. His sister and her family were there to meet us! I am finishing this blog as I countdown to my flight to go back to the US so please pardon any typos. I depart with such mixed feelings; its so hard to say goodbye to Lloydie, Karen and Deb, too, and to this beautiful country that has filled my heart. The Day of Remembrance was our on our last evening in the Village. 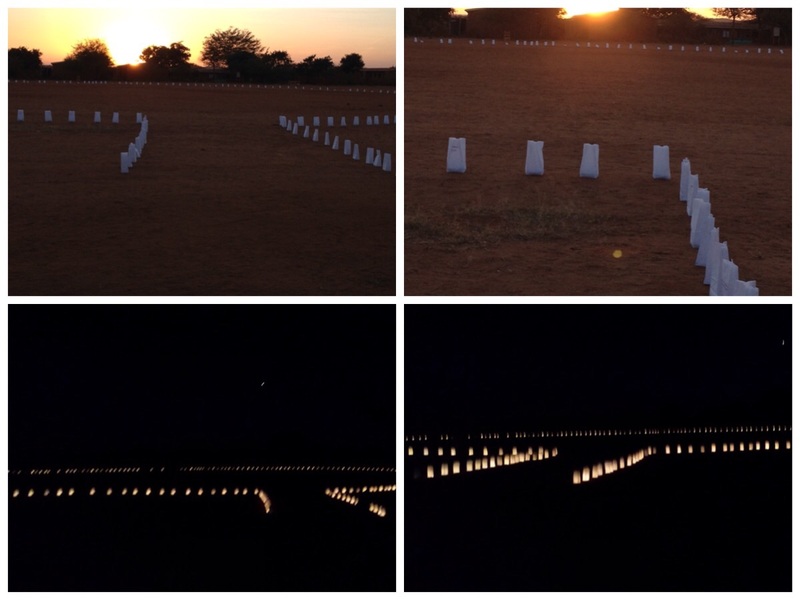 Although it was a very hot afternoon when we were setting up the luminaries, we were blessed with a beautiful evening. This was the second year for the Day of Remembrance in the Village, a cermonial evening dedicated to honoring lost loved ones. The majority of them are the parents of the children living there and the children of the grandparents, most of whom have died of AIDS. But as you recall from an earlier post, we encountered many people who had had recent losses during our stay this time including a number of the Tuko Pamoja women, some of the Nyumbani staff, as well as our dear friend Justus who lost his brother during the previous week. There has been so much joy and laughter, but also profound sadness. Simon, the Nyumbani Village counselor, and I worked very hard during the week to get the Village logistically and psychologically prepared for the day. We had many people and groups of people with whom to meet, but not as intense a schedule as Lilian and I had had in the Village last year, since most people had previous experience of the Day. However, there was a new princiupal at Lawson High School and a new priest, so I had the opportunity to meet with both of them to explain the purpose and flow of the ceremony. Both were very enthusiastic about the event and Father Michael talked about how he would focus the mass that was to precede the luminary ceremony. Simon, the current counselor, had already had some meetings with the primary school children, but we needed to meet with the high school students and the grandparents. Part of the purpose was to prepare them for the day, but we also needed to undertake the task of gathering all of the names of lost loved ones to be written on the luminary bags. With 100 grandparents and 1000 children, this was, as it was last year, not an easy task. However, when we met with the high school students we were able to engage the help of the cluster leaders. There are 26 clusters in the village, most with four houses in which reside one grandparent and 10 children! Meeting with the high school students, including the first year students who still had their primary school uniforms. We also met with the Susus who were very interested in participating in the event and they too provided us with the names of lost loved ones. We asked them not to include the names of the parents of their own grandchildren that they are raising, but still the lists were sadly so long. We were gathering names up until the day before which turned out to also be a whole marathon day of writing the names on the luminary bags. I handled the names collected from the children and fortunately Simon wrote the names obtained from the grandparents. We also had names gathered from the volunteers and staff. When Friday came, despite the frantic pace of the day before, we felt prepared, though in need of many extra hands to help set up the luminary bags. The first bag that I put down was the luminary for my son Brendan who would have turned 25 on the Day of Remembrance, making the day even more emotionally powerful for me. Fortunately all of the KEST volunteers and the other volunteers from the Village were enthusiastic about helping with the process which involved putting sand in the luminary bags and arranging them in an enormous circle. Deb captured a very special video of one of the children adding sand to Brendan’s luminary bag which was so poignant for me and evoked a lot of emotion. It was a very hot afternoon and we were all over heated, sweaty, thirsty and dirty by the end of the process, but fortunately had an hour to run back to guest house and take a cold shower before returning for the evening. We were all feeling good about how amazing the luminaries looked, how expansive the circle was, even before they were lit. When we returned to the field in front of the social hall, people were gathering and entering the church. Once the service began in the social hall, we waited about 15 minutes then began the huge task of lighting all the luminaries so that we would have them all lit as people were exiting from the mass and after the sun had set. Despite some initial challenges with the wonderful breeze that was cooling us, but blowing out the candles as soon as they were lit, we managed to get all of the luninaries, over 400, lit as the sun had set and people were exiting. The timing turned out to be just perfect. It was beautiful and moving in a way that words are hard to describe. People all moved around the circle which was arranged by cluster and found the names of their loved ones. Some kneeled, some sat or stood quietly and we began some glorious singing. Between songs we read every name. I read the names of the volunteers and visitors loved ones, some of whom we especially wanted to honor, such as my son Brendan, the sons who have died of a number mothers whom I know and Justus’s brother. Simon read all the names of the loved ones of the Village community. I cannot really describe the profound feeling of being there. A clip of the ceremony; you can hear the singinng in the background. It was so beautiful with all the luminaries lit under a magnificent starry sky and the singing was so moving and harmonious. At one point I walked into the center of the luminary circle and just stood there taking it all in, the lights, the singing, the powerful sense of community which had come together, and I felt like I was transported to a different place with a powerful connection to Brendan. 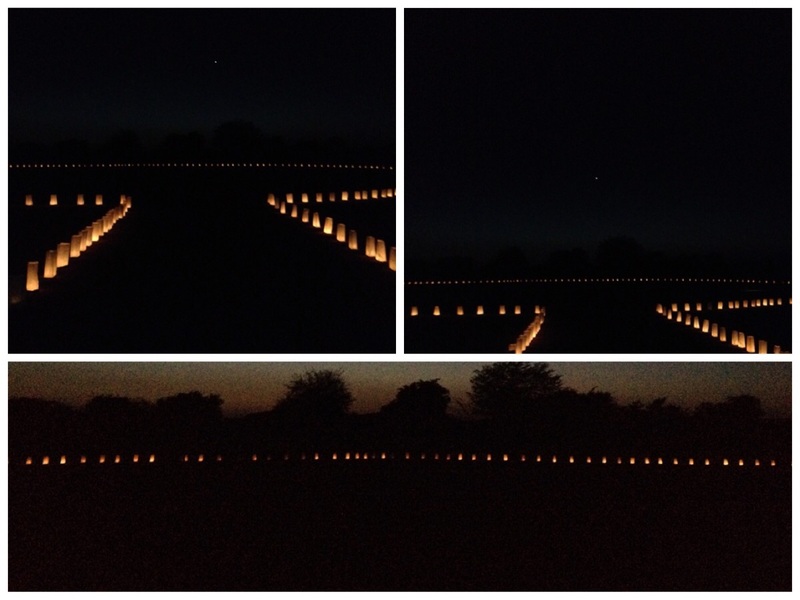 The community encircled the luminaries with song and with each other and the evening went perfectly. This was our last night in Nyumbani Village and we went back to Guest House, opened a bottle of wine, and toasted the accomplishment of the day and the satisfaction of the week spent in Nyumbani Village. The drive to and from Nyumbani Village was a beautiful one. Soon after the outskirts of Nairobi, the countryside emerged with that rich red soil and lush green of the Kenyan landscape and mountains terraced with gardens. It is always a wonderful feeling to get away from the traffic around Nairobi into the fresh air with so much beautiful scenery. It was a long drive to the Village, but made much easier by the views and the excitement of knowing that we would soon arrive at Nyumbani Village. We arrived late afternoon on Monday, in time to have a dinner of rice and githeri, a traditional Kenyan stew of beans and maize. 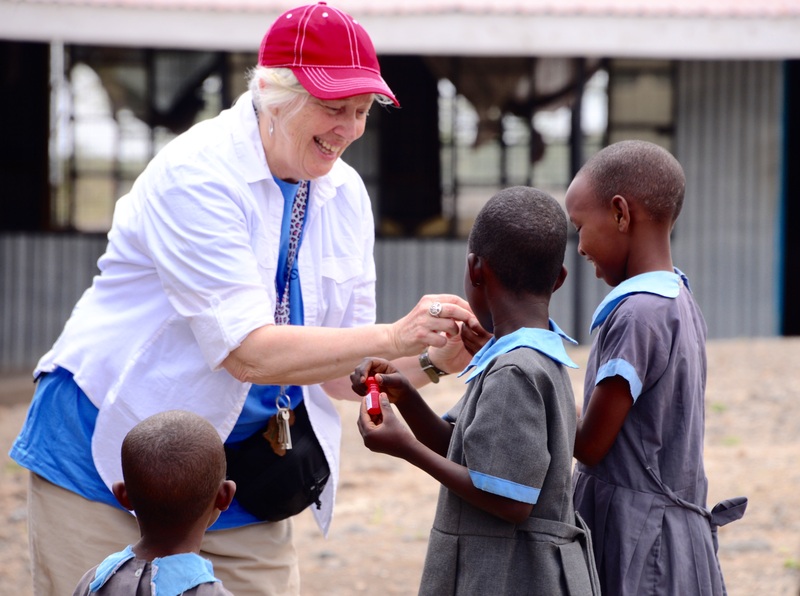 We then began getting settled into our living quarters, but not without stopping along the way to visit Susu Janet who is always excited to see us. We were surprised to see a very welcoming sign on the door to the guest house when we arrived. This was made by one of the volunteers who were already there, three post college grads doing short and long term placements in the Village. Kara, the Princeton in Africa fellow will be there for an entire year. We really enjoyed working with these other volunteers. It was the next morning when we really got a better view of what we had already realized was the greenest we have ever seen the Village. This is not usually the rainy season; that is in the summer months. 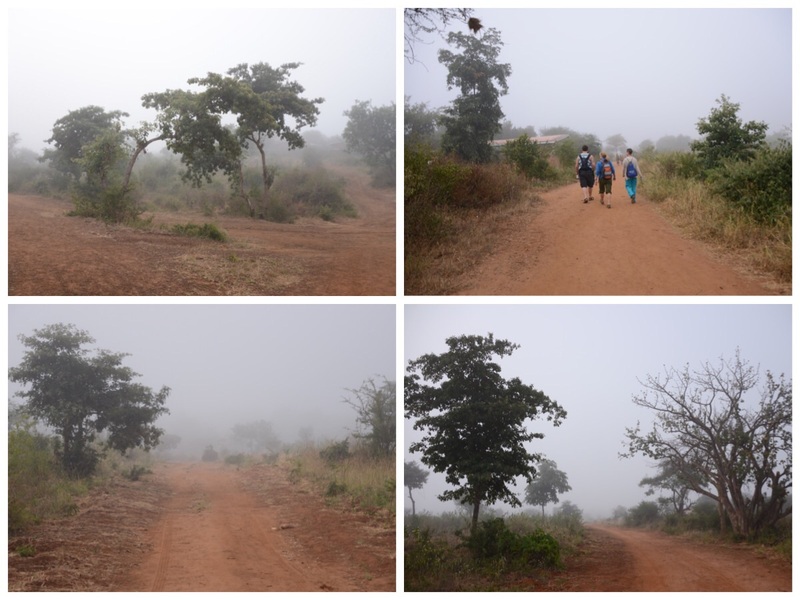 However, since there had already been a significant rainfall in January, the Village was really lush with vegetation, all the shambas (gardens) were thriving and I momentarily thought I was lost on my way to the clinic becuase it was hidden from the usual view by all of the vegetation. Since there were no new travelers in our group and we all had specific projects to work on, no tours or orientation were needed, and we all got right to work. Deb has been working on a memory book for all the grandparents in the Village, interviewing them and recording their life histories to be preserved for their grandchildren and other generations to come. She and the other KEST volunteers have done over 100 interviews and the book is ripe with fascinating stories, culture and history. Lloydie had a number of projects to work on in the village, but major among them was teaching in the sister school program. One of the lessons was focused on a book with the theme of one person can make a difference, a philosopy she truly lives. She also delivered countless new backpacks. All of us together sat down and went over our donation funds and the request lists to determine how our donations could be best used. We were able to purchase 200 blankets and 200 sets of sheets, three first aid kits, all the needed sports equipment and will also be purchasing 100 mattresses. Thank you to our many generous donors! This is in addition to the planned purchase of shoes and socks for the 85 children of PCDA! And the many skeins of yarn, beads and other items that were donated. My work was focused on working in collaboration with the Village counselor, Simon. My role has always been to be a consultant regarding mental health care of the village residents and some of the surrounding community. And last year my role grew to include the preparation and organization for the Day of Remembrance. I will blog about that event in a separate post. Being in the role of a consultant has allowed me to hear many of the personal stories of the children who now live at Nyumbani Village. They are powerful stories of grief, loss and struggle for even survival before they were brought to Nyumbani Village. As I have said before, part of the magic of the Village is knowing that the children who are thriving there would not have lived without coming to the Village. We all work while we are at the Village, we are often quite busy, but not so busy that we cannot enjoy the children or the grandparents we encounter throughout the day and especially on the walk home at the end of the day. Since the children love to have their pictures taken and I love to take pictures, I often have fun with them by doing that. This year I brought an instant film camera and I was like the Pied Piper after the first child got of a polaroid of herself and shared it with the others. 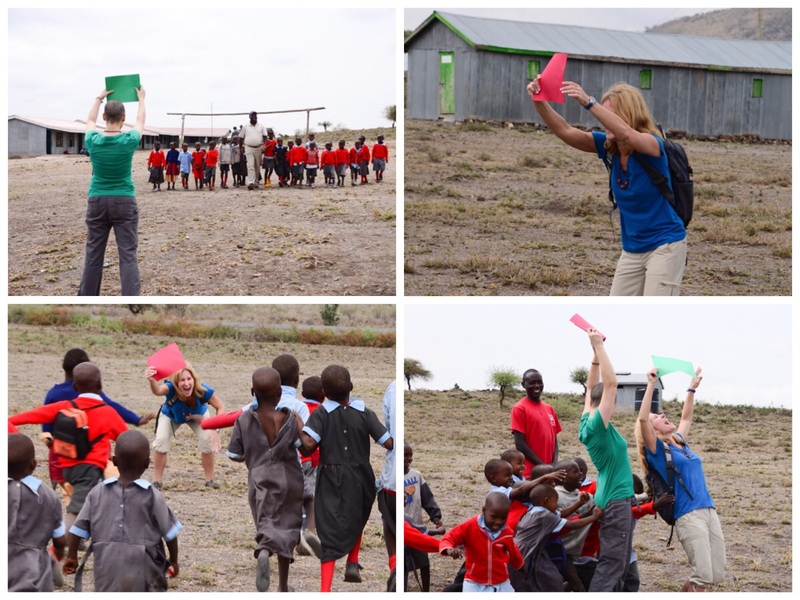 Even the Susus joined in the fun, and the fascination, of having their own instant photos. You can never pass a SuSu without a Kamba handshake and a Kamba greeting and they all seem to delight in quizzing us on the various greetings and responses in the Kamba language. But for me, I most enjoy a chance just to engage with the kids, get a random unexpected hug or my hand held, and, of course to take pictures of their beautiful faces. I enjoy it when I get to see the kids playing and feel especially lucky when I am able to catch the children rehearsing a dance performance. The girls practicing a dance performance. And the little girls wanting to join in! Whether it is chirping weaver birds, clucking chickens, dancing and singing children or spirited grandparents, the Village is always bustling with the simple things of life. And in the evening, night falls often with the sound of children singing and a most beautiful starry sky. The finale for our week was the Day of Remembrance and I will write about that in my next post. 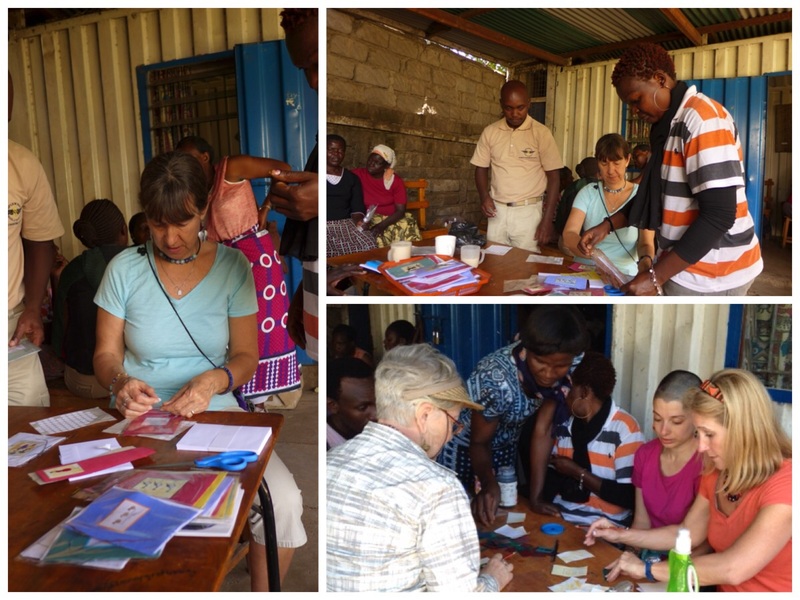 Saturday was the Fourth Annual Women’s, a day of learning, collaborating and bonding for the women of Tuko Pamoja. Every year we think it can’t go any better and somehow it does. 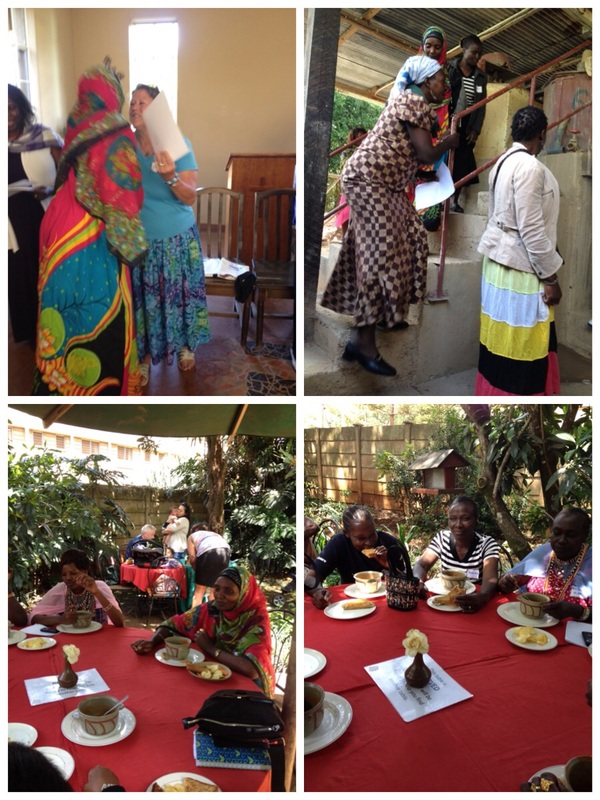 We came together in the morning at Dimesse Sister’s Retreat Center where the sisters had prepared chai and mandazis (yummy Kenyan “doughnuts”) to start the morning. The women started arriving and signing in, looking lovely in their best clothes. They had an opportunity to socialize a bit and then we had opening remarks about the goals and the agenda for the day. 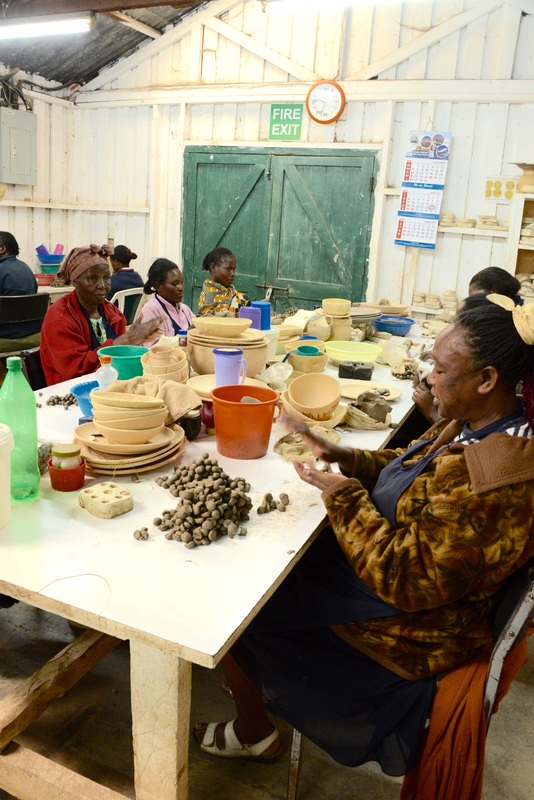 KAZURI, which means “small and beautiful” in Swahili, began in 1975 as a tiny workshop experimenting on making ceramic beads made by hand. 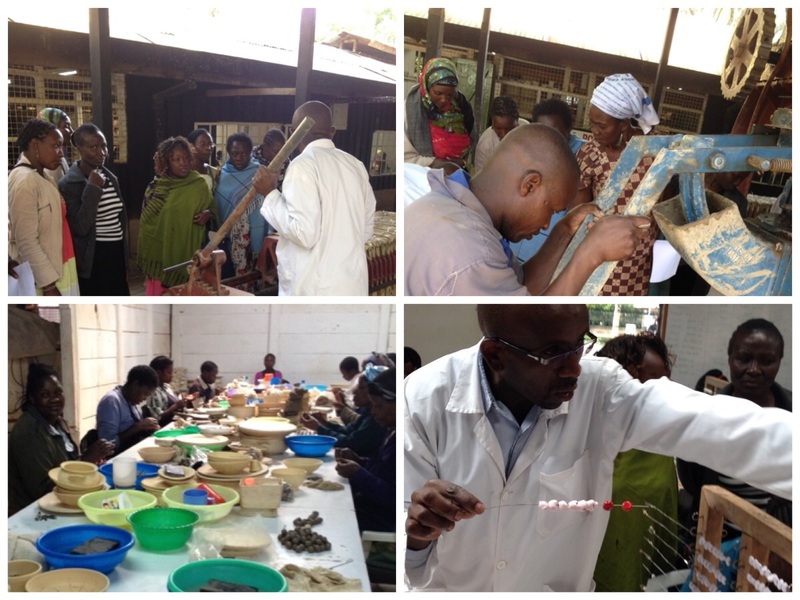 At Kazuri Beads they are also committed to opening their factory for tours and sharing some of their training, marketing and other tips. Not only are disadvantaged women from the slums bussed there, but they also have on site daycare and a medical clinic. The owner is very dedicated to his workers and keeps all of them employed during lulls in the business. The goal of bringing the Tuko Pamoja women there was to have them meet with the production team and with the marketing staff in the on site retail shop. The staff were VERY generous with their time and teaching, and the women were enraptured with the business and very inquisitive with their questions. One woman remarked at the end of the day “I never knew something so beautiful could come from the ground I walk on!” The production team emphasized the dire importance of several levels of quality control and the ongoing need for new product design—both concepts which we had been working on in the individual groups all week. 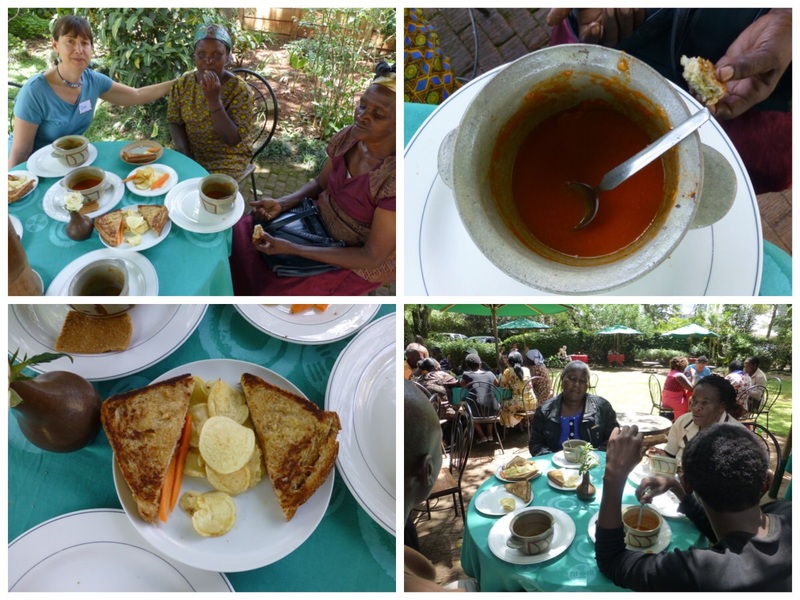 Following a very successful visit to Kazuri Beads, we all headed back to Dimesse retreat where the staff had prepared a very plentiful traditional Kenyan meal and the women all ate very heartily. Then we headed to Kibera. 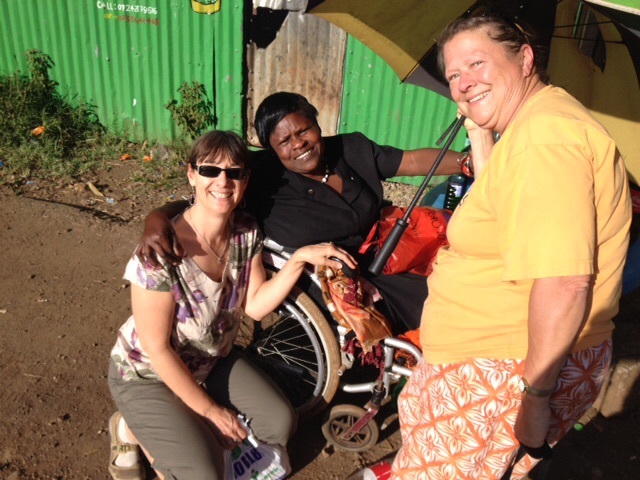 After lunch we left for Kibera to visit the Power Women’s Self Help Grou. We selected this location because this is an example of a self help group who have made a lot progress in establishing themselves. We drove into Kibera so were able to see more of life within the area. Children always flock to greet us with waves and choruses of “How are you? 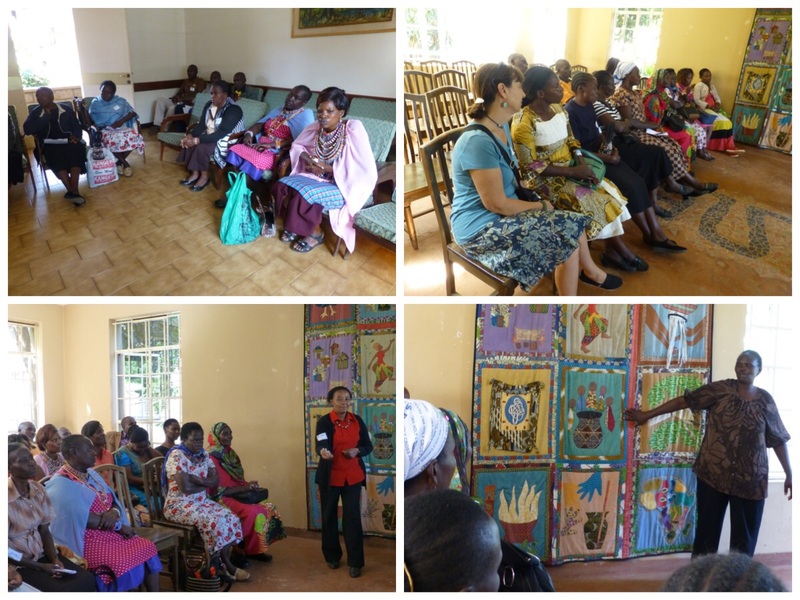 I am fine!” Once inside the Power Women’s workshop the women were given a presentation of the history of the group which began as a simple self help group doing crafts. The women were able to save enough money to rent a shop and then went on to develop a beauty parlor (“saloon” :))with the help of generous benefactor and finally a daycare. They were able to provide the women of TP tips about further success emphasizing the concepts of saving and working towards a goal. 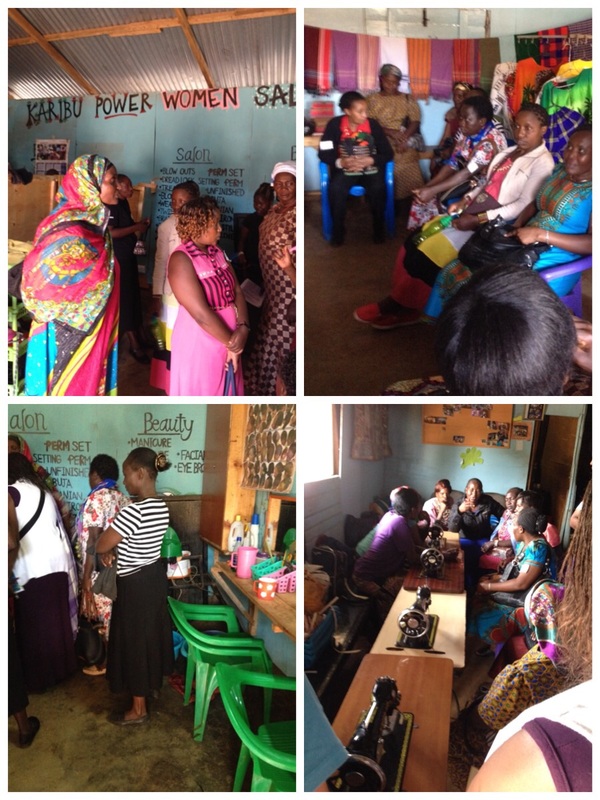 And the women had an opportunity to see the daycare and beauty parlor. We then went to a meeting area in the Lea Toto site of Kibera to carry on the program. Karen presented to the women how to keep a ledger of income and expenses and to save a little money on a regular basis. The concept of keeping a record was entirely new to the women and they were glued to the presentation and each followed along filling in the ledger beginning with the 3000 KS there had been given as a bonus. Then Lilian and I took the lead and talked with the women about the effects of stress, stress management and techniques for dealing with it. We led an exercise on deep breathing and the women were quite enthralled with the idea that they could actually do something to decrease their own stress levels. 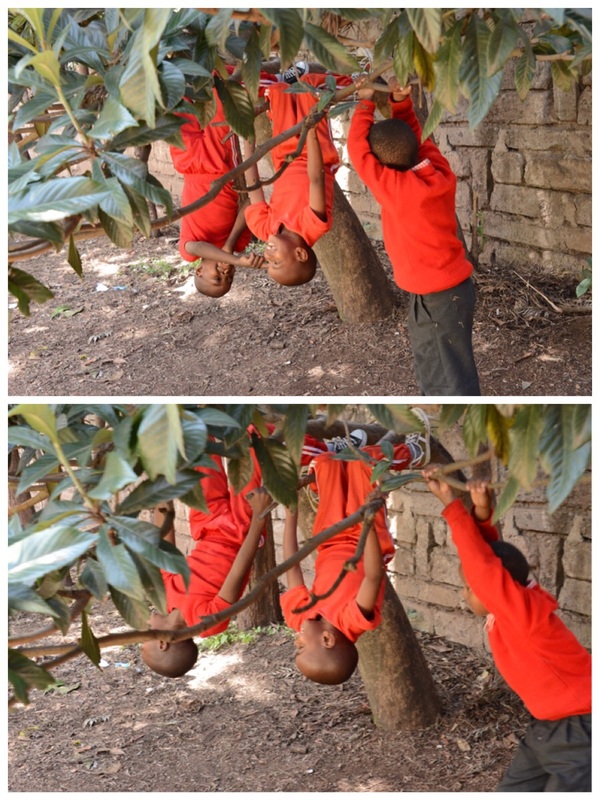 Sometimes the simplest things make the biggest difference in Kenya. After the program was finished, we asked the women to give their feedback on what they had learned during the day and we were thrilled with their comments as we felt that we had succeeded in really helping them to learn some crucial skills. They remarked about each site visit, the financial skills presentation, managing stress and more. 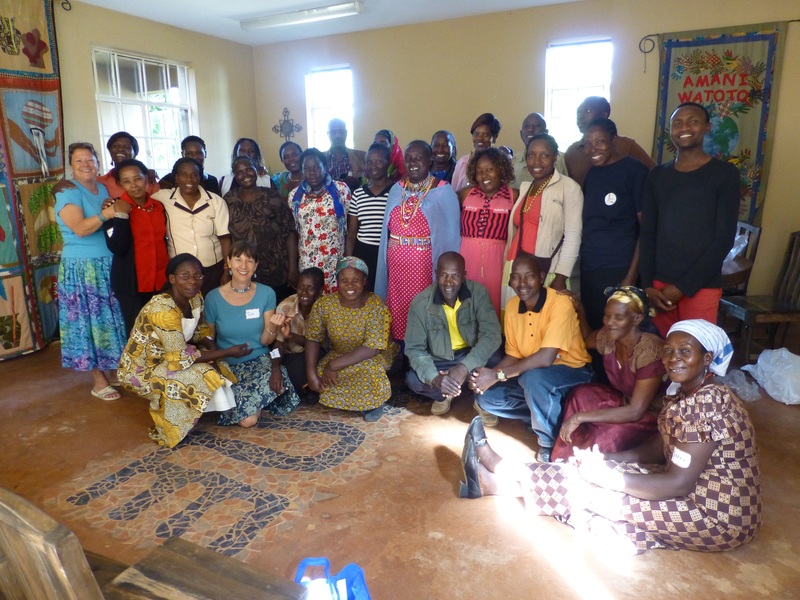 One women from PCDA spoke eloquently to thank us for traveling so far, leaving our work and our families at home to come to Kenya to create this workshop for them and for working with them to help them become more successful. Maggie, our Board member from Amani led the closing remarks which were truly inspired and focused on working together, sharing and supporting each other, the real concept of “Tuko Pamoja” (we are together in Swahili). 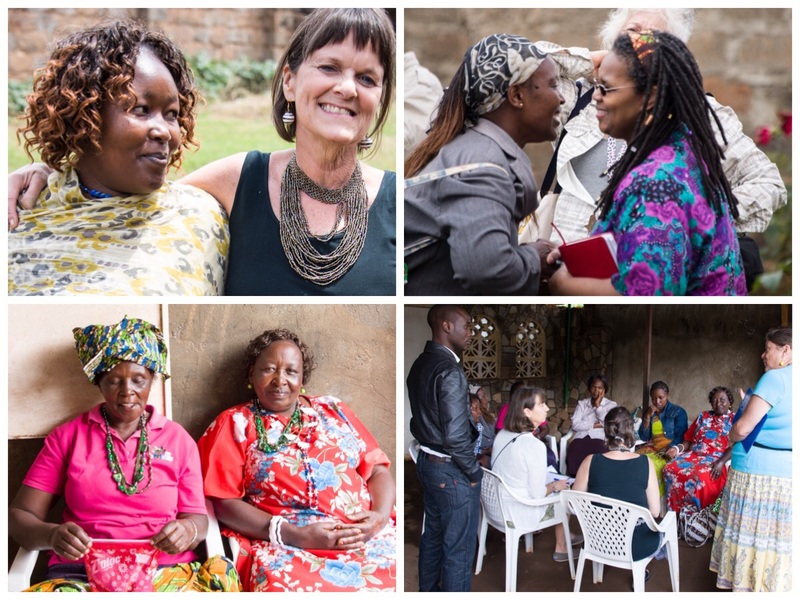 We thanked all of the site administrators for each group and the Kenyan Board and all of the Board Members joined together to thank the women for all of the hard work they do and to reinforce that we are all bonded and working together. 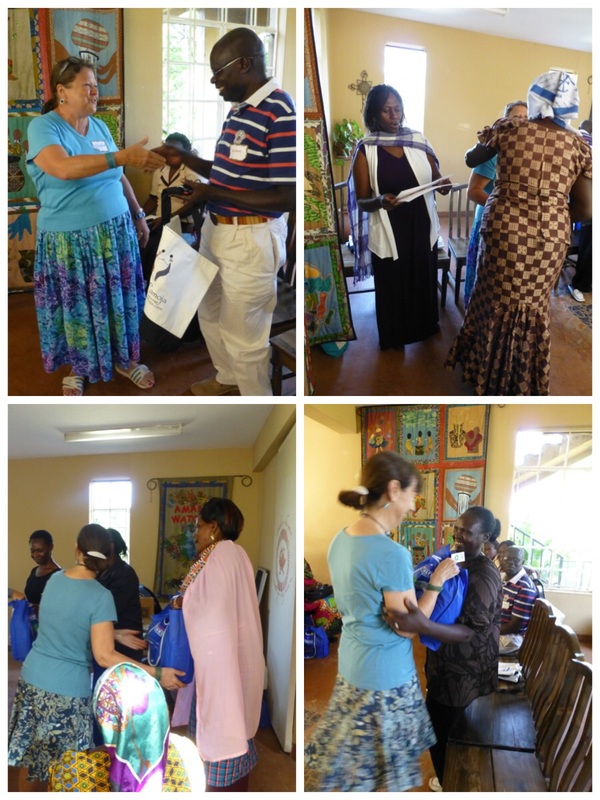 Then each of the members were given a formal certificate of attendance, congratulated and presented with a gift bag of basic necessities: maize flour, sugar, oil and salt. We ended our day in a large circle holding hands and singing a beautiful song taught and led by Lilian who always does a laudable job in the capacity of celebration with song. Then she instructed us that we could not leave the group without hugging at least five other people. That wasn’t at all a challenge, and some of us likely hugged over 30 other people. It was a heartwarming ending to a day that felt like it had gone perfectly. Lucy joined us for the day and her brother Charles came later as he was in a Red Cross training all day. You may recall that both Lucy and Charles grew up in Nyumbani Village. 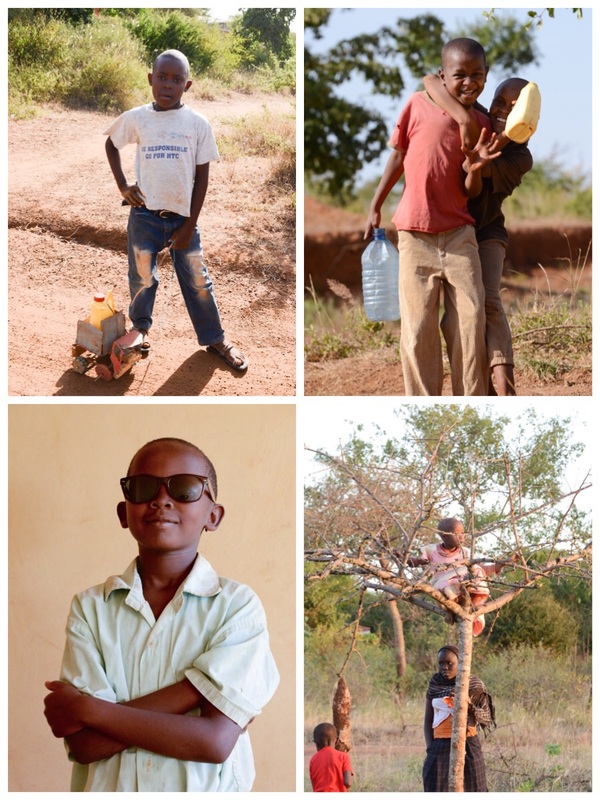 Currently Lloydie is sponsoring Charles in his education as a hotelier. Lucy is attending Kenyatta University, sponsored by Team Lucy, which includes Deb, Karen, and me along with two other women from the states, Carla and Marguerite. Lucy and Charles returned to Dimesse Retreat to have dinner with us and to spend the night. We had a wonderful time catching up during dinner. Lucy is a very bright responsible and sweet young women, who despite being on a tight budget, always brings a gift for each member of the team. This year she brought us each an envelope with a picture and a bracelet beaded with each of our names. 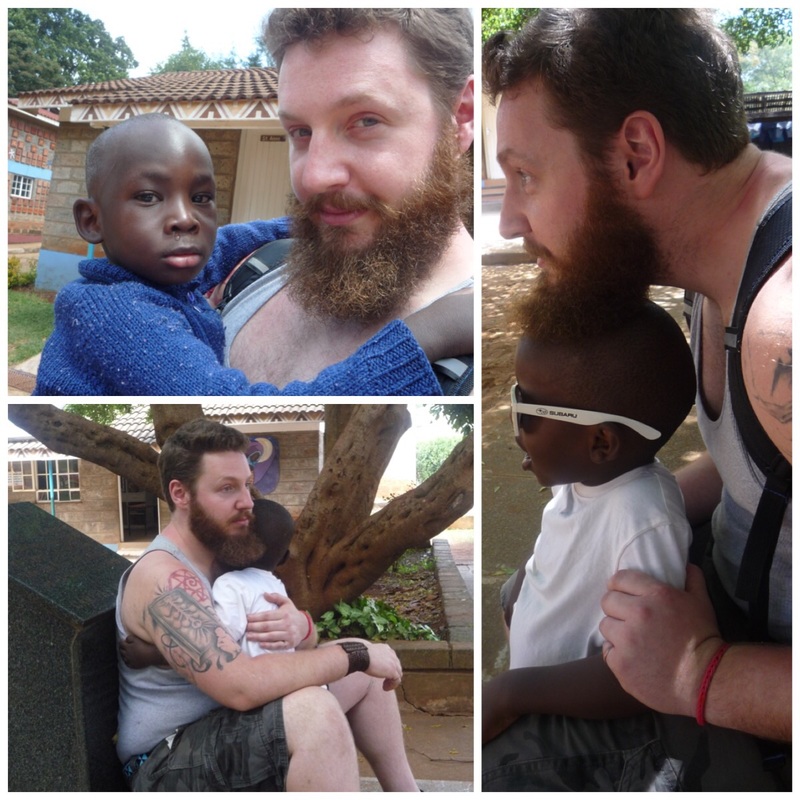 The following day was Sunday, and if we are in Karen, we always head over to Nyumbani Children’s Home to go to church with the children and this time Lucy and Charles went with us. We met Protus, the Director of the Children’s Home who returned from being away because of a death in the family. We talked with him, as we had talked with Sister Mary, about the difficulties which we had encountered in Customs and tried to brainstorm some solutions. Following the always jubilant, singing, drumming, dancing mass which is very much directed towards speaking to and interacting with the children, we went off to tea with Sister Mary. That gave us an opportunity to discuss some other issues about the Nyumbani programs. We had a really delicious lunch at Spurwing travel which is next door to the Children’s Home and is where Justus is employed. 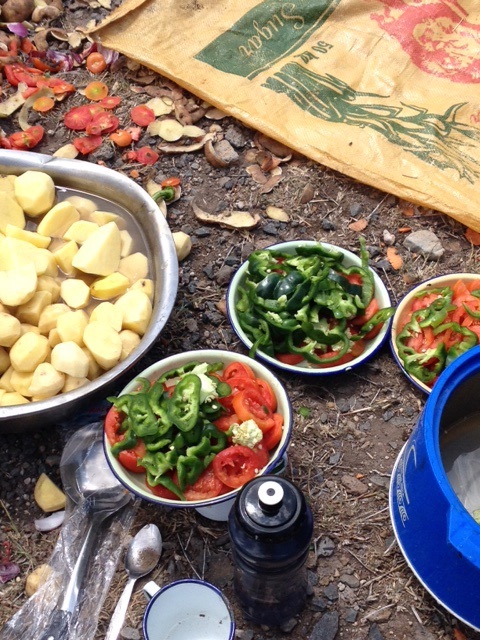 We all savored having some delicious home cooked food, especially being able to eat a salad, all of which we really miss while we are here in Kenya. Right after lunch we had the pleasure of meeting with Michael who is the son of the Spurwing owners and is a very successful attorney and business owner at only 23. He was extremely helpful and very generous with his time in offering the history of developing his businesses and some information about micro finance loans as that is one of his businesses. All week Karen has been meeting with various people within the Numbani Programs toward the goal of creating micro finance opportunities for the young people served in the Lea Toto programs. Becoming self sustaining with a reliable income is an extreme challenge for them and beginning small businesses is a much greater possibility than a actually finding a job. Michael offered some excellent insights. Meeting with him as well as people art Nyumbani has helped Karen to come up with a preliminary plan to help with a program in this area. This would could make a difference in many people lives if it can move forward. Michael was also helpful to Lucy since she will graduate with a business degree and he offered to facilitate the process of her finding a suitable attachment (i.e. internship). Our other tasks for this welcomed low-key day were to purchase the necessary items for students who are going into high school. 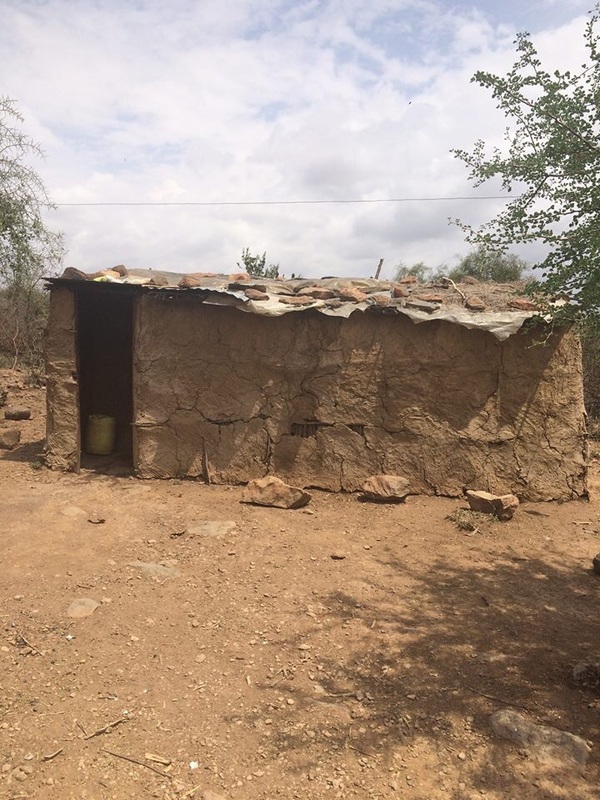 This is always a boarding school in Kenya and requires school fees as well as supplies to live in a dormitory. We brought one of the new Form I students ( a freshman) with us as we went off the the local Nakumatt (the Kenyan equivalent of Walmart) to get the supplies. 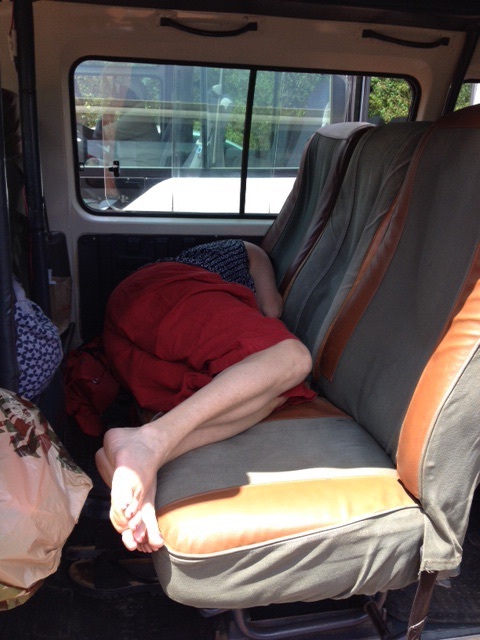 The list included many things, among them was a pillow and mattress, bedding and other daily necessities. All of us remember this student as a little girl so its hard to believe that she is now moving on to high school. 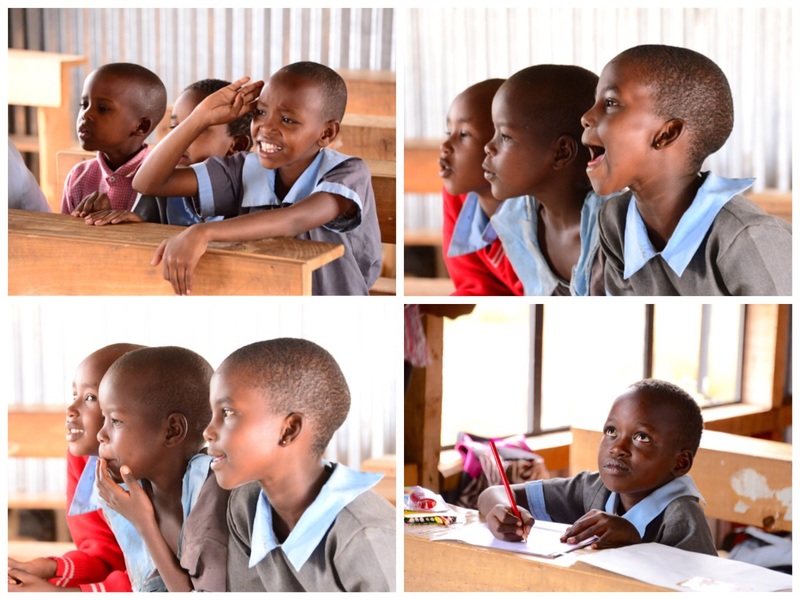 The school year begins in January in Kenya. Once finished we went back to Kazuri beads, this time to do a little shopping, but not until after we had to say goodbye to Lucy and Charles who, for most of us, it will be a year before we see them again. 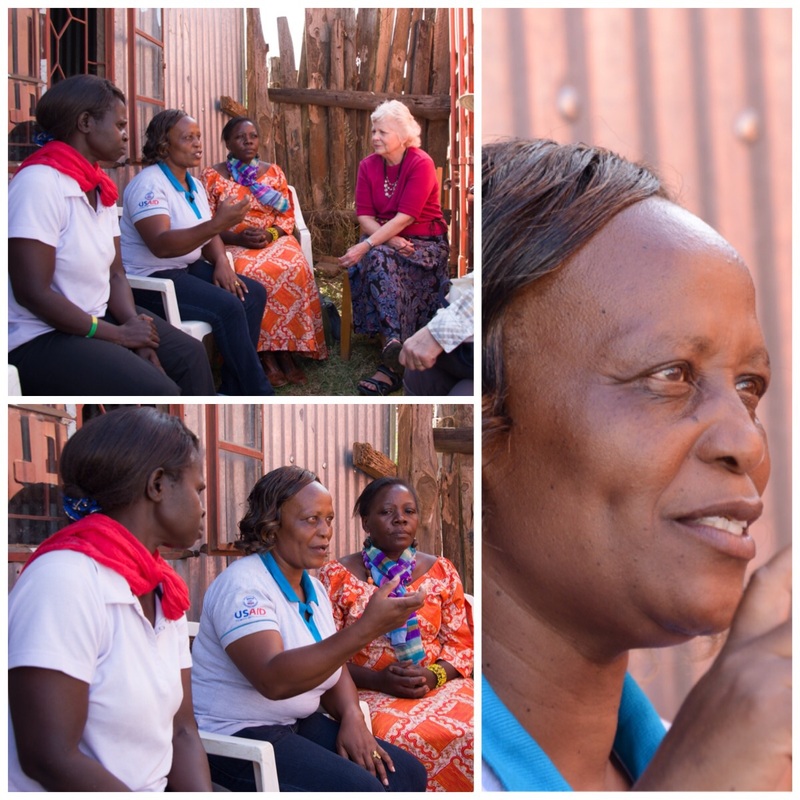 It is ALWAYS so hard to say goodbye in Kenya, even when it is “See you next year.” At the end of the day we were reorganizing and repacking to head to Numbani Village the next day after a planned meeting with the self help group in Mukuru in the morning. These low key days are always relative; they are easier than the days with events like the Women’s Workshop, but still packed with more things than I can put into this blog. We always go to bed tired, most often too late, but with a true feeling of satisfaction. I will explain more later, but it has also been a day of much intense laughter as well as sorrow and tears as we encountered more loss among our Kenyan Family, loss that resonated very much with my own experience. And the sun finally came out so we could enjoy much outside in the backyard at Spurwing! A Treat on the day of departure! A wonderful rendidtion of Africa posted so timely on my FB stream today! Thought everyone should enjoy! 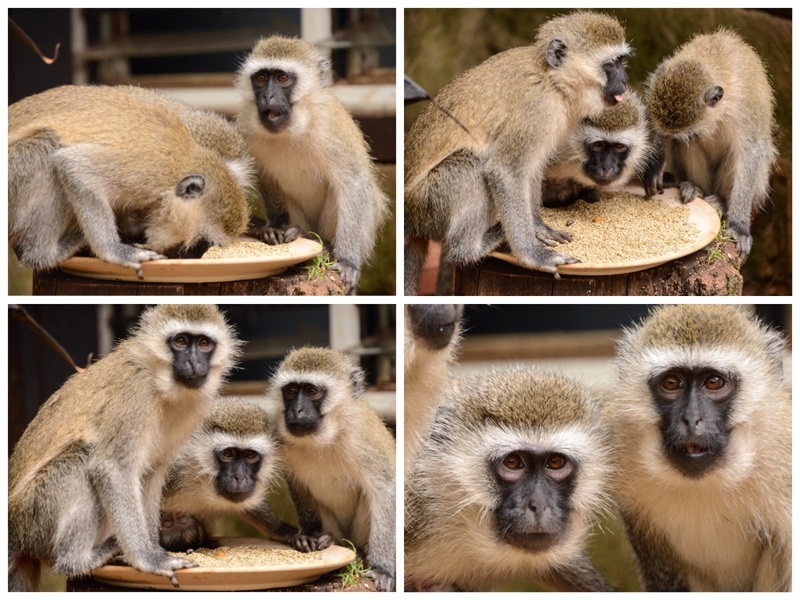 The next post will really be from Africa …. Having departed from the Village and trying to squeeze in a blog post in the wee hours of the morning showed me the next day that my haste and weariness had caused me to upload the wrong, long unedited video clip talking about the event. I also neglected to upload the video about lighting the luminaries. Since this was one of those “you just had to be there” experiences, I really wanted people to experience a little bit of what it was like through the video clips. I am grateful to other people, particularly Justus, for providing me with photos and videos. I was so busy making sure that everything was going properly that I didn’t have an opportunity to use my cameras. It was a bit of a challenge to get all the luminaries lit and then we were all anxiously worried that some would go out before the mass was finished so filming wasn’t on my mind. Amazingly enough, everything went perfectly–all of the luminaries were lit despite lighters that were either not working or searing our fingers, a hefty wind that blew out matches as soon as they were lit, and luminary bags which required a lot of sand in the bottom to keep them from blowing over. 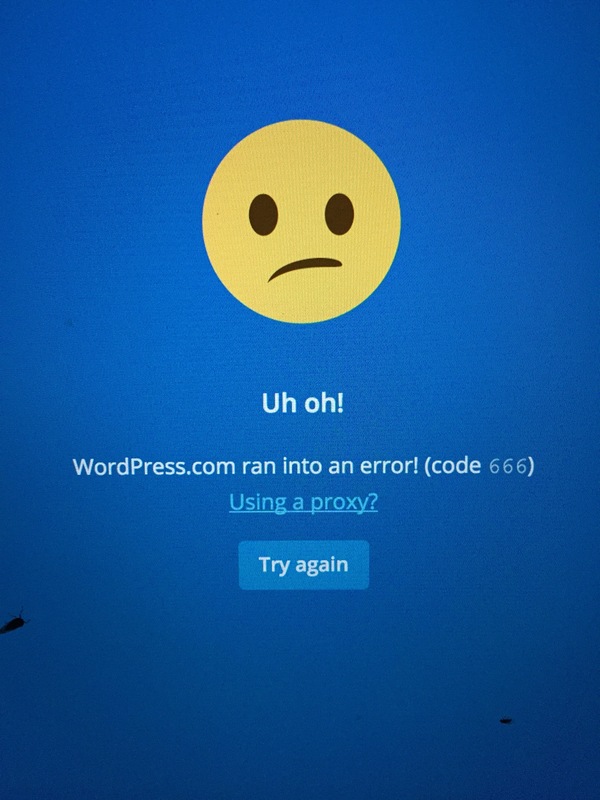 It felt like a bit of divine intervention that it was perfect in the end. So I am including here the correct video clips and wanted to add a couple of meaningful things that I neglected to mention. In addition to lighting a luminary for my son Brendan, I also lit luminaries for several other mothers who have lost their sons and a close family friend who had lost his brother all under tragic circumstances. So I want to let those mothers know that I lit luminaries for Orlando H, Benjamin B, Jake H, Greg M. and George W. and that all of you were in my thoughts during those moments of silence as well. I also wanted to be sure to say that this first Day of Remembrance was held on Brendan’s birthday, the day that he would have turned twenty-four. This was the first of what will be annual Days of Remembrance which will hopefully over time play a role in the healing of the grief of the Nyumbani Village children and many others of us who have been impacted by grief and loss. If you get this post by email, you should be able to click on the videos and be taken to the website to view them, but if you have trouble go directly to the my blog site and you can view them there. We have been winding down the trip and spent the weekend going on safari in Ambocelli and Lake Nakuru and visiting the Kiambethu Tea Farm. I will have MANY wonderful photos to post from those adventures since we had very successful and exciting animal sightings. I am now sitting in the airport in Nairobi typing after many tearful goodbyes that seem to get harder every year even though I can definitively say, “See you next year.” So I will keep blogging some more of this trip to stretch it out and keep it actively in my heart as I return to life back at home which seems so much still like a distant time and world away. We arrived at Nyumbani Village Sunday following a lovely drive there. 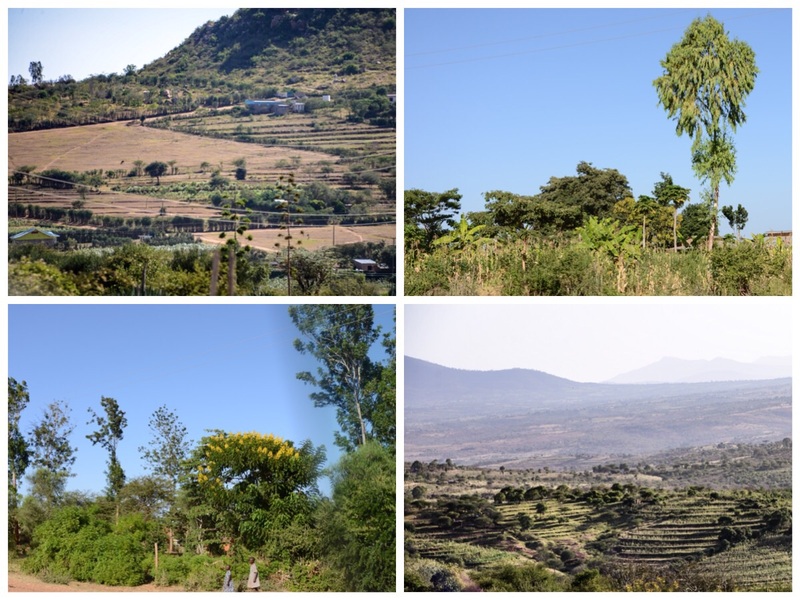 There is much beautiful countryside on the way with layers of mountains on the horizon, beautiful terraced gardens gracing the mountain’s sides, fields of zebras, lush mango trees heavy with ripening fruit and beautiful blooming trees full of yellow and red flowers. I always appreciate the travel here because it’s an opportunity to take in some of Kenya’s most beautiful landscape. We arrived just as the sun was golden and setting over the Village landscape. Starting out in the Village is always beautiful in the morning. The week began with a meeting with the administrative staff of the two departments at the Village–Home Care, everything involving the people of Nyumbani Village and Sustainability, everything involving the environment including food, farming, and many creative projects which serve to make the Village more self sustainable. We got a brief synopsis of the major projects happening in the Village such as biomethane, tilapia aquaculture, beehives and honey, extensive vegetable gardening and fruit-growing for feeding the Village as well as for sale. The crops including vegetable and fruits are irrigated from bore hole and sand dammed water pumped by a solar pump and there is a new solar greenhouse. All of the furniture used by the Village is made there in the Polytechnic School and production is plentiful enough to allow for sales. There is also a program called Trees4Kids, which includes planting many acres of Milia trees each year. This variety matures in 10 years and can be harvested for timber with the first harvest due in 2017. I won’t go through all of the sustainability projects, but only say that they are quite ingenious and amazing and that the Village serves as a model for sustainability. We also heard about the status of the Village residents which currently includes just under 1000 AIDS orphans all raised by biological or adopted grandparents, most of whom are grandmothers. Each of the grand mothers raise 10 or more children in blended families which in a model which was the first of its kind in Kenya. There are many beautiful faces in Nyumbani Village and always fun-loving children who are very engaging with their smiles and antics. 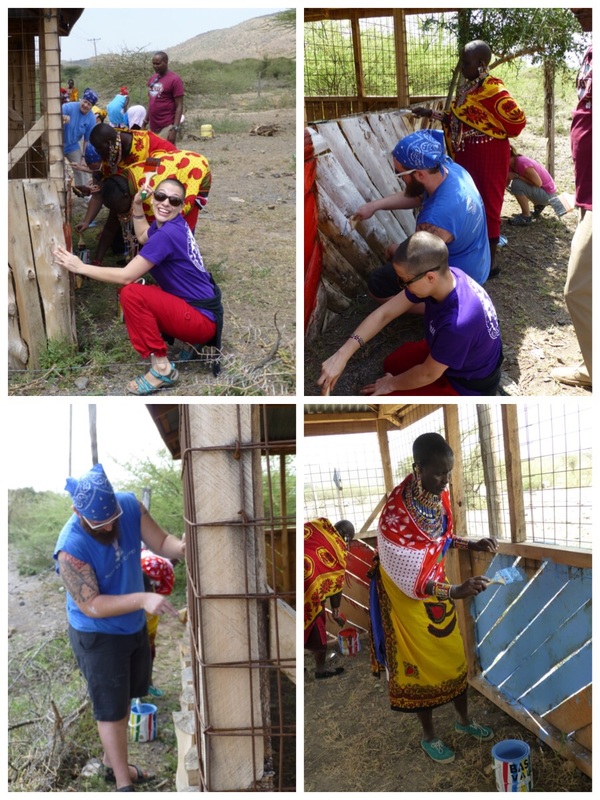 There were many projects that the volunteers worked on during our week at the Village. Lloydie and Irma taught in the classrooms; Jon, Irma, Kristen and others planted the sisal garden and worked in sustainability, Kristen worked in the medical clinic, Deb and Meagan worked on the memory book that includes histories of all of the individual grandparents, Judy, Valerie and I worked in the counseling clinic and I worked with Lillian to prepare the Village for the Day of Remembrance. The days were very hot, but also very productive. Given how hot it was, I was relieved that I wasn’t working in the sisal garden, but Irma and especially Jon were very enthusiastic about the planting and were able to work side by side with some of the grandmothers. We also held a meeting with the grandmothers to go over the success of their basket sales through Tuko Pamoja over the last year. The Village Memory Book which includes interviews and photos of all the grandparents and recounts their personal histories is a project that has been in the works for several years and is almost complete. The grandmothers or Shoshos are very interesting characters with a lot of personality and a penchant for singing and dancing and greeting the visitors with a lot of fanfare, teaching them Kamba at the same time. We always truly enjoy them and most especially enjoy the children. There were also a few other volunteers in the Village who we got to know during the week, all of whom turned out to be of tremendous help with the luminary ceremony on the Day of Remembrance. I am writing a whole week after we first began our work in the Village so it is hard to now describe all the work AND most of all, every touching moment. The times that most stood out for me personally were talking with all of the Village to prepare for the Day of Remembrance and being invited to one of the homes in the evening by one of the high school students. At the time I thought that there was an issue in the home and that Lilian and I were invited to try to help with that. However, after I arrived it became clear that the real agenda was to ask me many questions about the U.S.–about farming, schools, food, religion, climate and so much more. The keen curiosity and the hospitality of the grandmothers and children in the home I was visiting was really delightful. By far my most important and meaningful work was talking to the children, grandparents and staff about grief and loss and preparing for the Day of Remembrance. 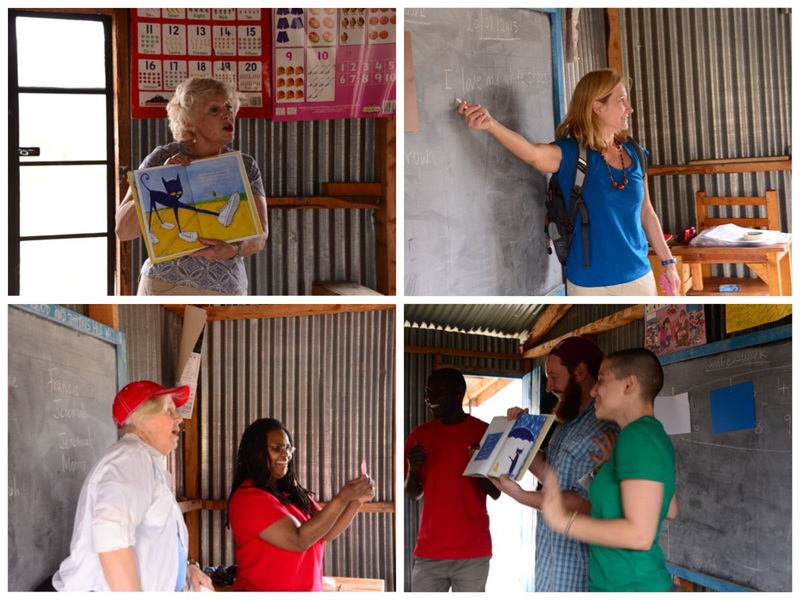 As soon as I arrived Lilian and I mapped out a schedule that enabled me to spend time in every class at all grade levels to talk with the children about loss and their most profound grief, the loss of their own parents. I was also able to speak with the grandparents and the staff and there was whole-hearted enthusiastic support on the part of the administration (Raphael, the home program manager, the school principals, counsellors, especially Lilian and more) for moving ahead with the Day of Remembrance. As I spoke with all the groups, having Lilian as a translator for the younger children, I talked about grief and loss as universal experiences, ways to cope and ways to honor and remember loved ones and carry them in our hearts. Depending on the age of the children, my talks were simple to more complex, but the enthusiasm for having a special ceremony to honor and remember those lost loved ones was universal. 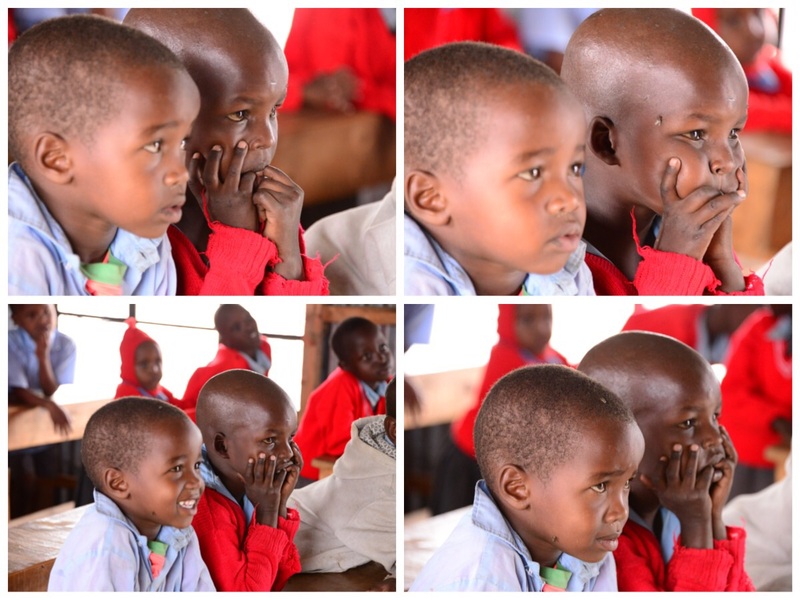 At the end of each talk, I had the lovely experience of hearing the children sing and even had Lilian write down the words to my favorite Kenyan Swahili song so that I would be able to sing with them. Lilian and I scurried around from classroom to classroom and school to school, the Polytechnic School, the primary school also know as HotCourses and Lawson High School. As I talked to the children it was very interesting to see their reactions and watch their faces as grief was as times very palpable even though it has rarely been acknowledged in the Village. And grief was ever more present than I even expected because just prior to our arrival at the Village, the principal of the Polytechnic School, a very beloved teacher, had died at only 42 years old. Everyone knew “Mr. Mike” as the person who really “fathered” the school so there was a great deal of sorrow about this very big loss. As we worked toward the Day of Remembrance, there was a great deal of planning and coordinating with school staff and the home care staff and Lilian and I worked very closely as a team. Judy also joined us on some of our visits to the classroom and in preparing the luminary bags. 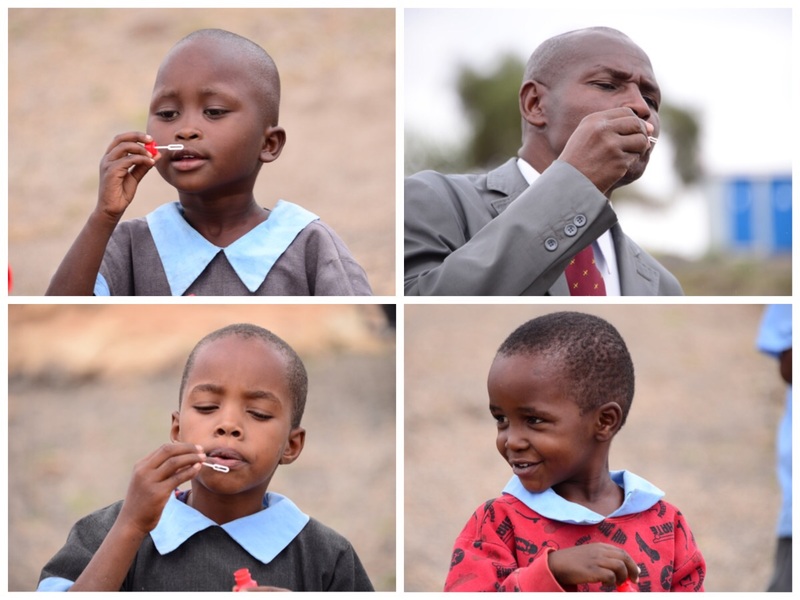 One of the biggest tasks was getting the names of the children’s parents who had died as we wanted to be sure that everyone was included in the ceremony so no child’s parents and no grandparent’s children would be left unacknowledged. Lilian and I often looked at each other saying, “I can’t believe it, but I think this is really going to happen.” Although there was much support all around, I wasn’t really sure how many people would actually attend until the evening ceremony began. And then I was absolutely beyond words when the entire Village poured into the Social Hall until there was standing room only and people were not even able to fit in through all the doors. That’s when I knew that we were doing something that was profoundly important and special to address their issue of unacknowledged loss in the Village. The evening began with a special mass also devoted to talking to the community about loss, remembrance and honoring our lost loved ones. As the mass began, the choir trained by Lilian and having practiced for weeks was unbelievable beautiful with rising harmonious voices. All of the volunteers and I were outside during the mass setting up the luminaries which had by then been prepared with the names of lost loved ones of the children, grandparents, staff and volunteers. I am so grateful that all of my fellow volunteers worked so hard together to accomplish the lighting of the luminaries. There were two lines of luminaries leading the way into a very large circle. The two lines of luminaries were led by all the names representing staff and volunteers with a luminary for Mr. Mike on one side and for my son Brendan, who would have turned 24 on this day, at the other. Then the luminaries were arranged by house and cluster so that every child would be able to find the names of their parents in the circle. We arranged nearly 500 luminary bags and lit all of the candles in them as the sun was setting and the choir was singing beautifully. And as darkness fell, they were all shining like stars. When the Mass ended, everyone came out of the Social Hall (used as a church) and the crowd was in awe of what they saw–a beautiful circle of nearly 500 shining luminaries with names on each one. One staff member remarked “It is like you have brought heaven down here to us.” There was glorious singing as people gathered round the circle of luminaries and then there was a prayer and a moment of silence led by the priest. Then Lilian and I read every one of the names. We periodically stopped for singing and other silent moments as we worked toward and finished the names of all the parents from cluster one to twenty-six. Even with almost 1200 people there, most of whom were children, every moment of silence was completely quiet and every song was in beautiful harmony. After I had read the names of the loved ones of the volunteers and Lilian was reading the children’s parents names, I walked into the circle to hear everyone singing around the shining luminaries and under a beautiful starry sky. 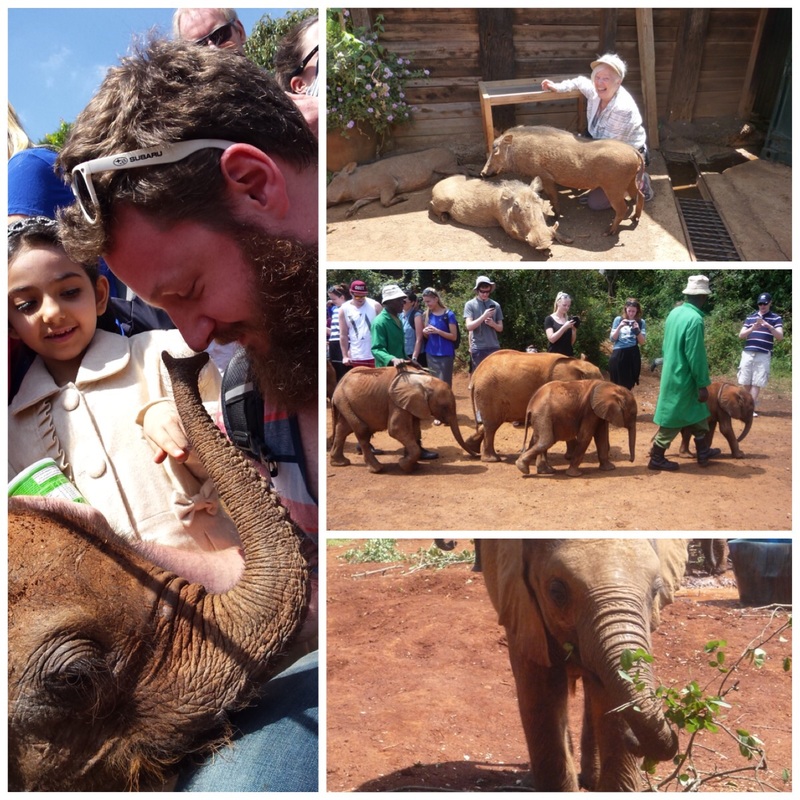 This became my most magical moment ever spent in Kenya. It was overwhelming to think of the enormity of the losses, but also extraordinarily moving to feel the coming together of this community and support that they shared. A few of the children knelt and prayed in front of their parents luminaries, but it was not somber, it was a time that was truly of honor and remembrance and especially of acknowledging the commonality of that experience which had previously been unspoken in the Village before. I was thinking of all those children, but also of my son Brendan as I felt that he was in some way there with me too. I have so much to write after the beautiful drive to Nyumbani Village but lack of internet connectivity has made it impossible to blog. I am snatching this small opportunity to check in, even though I am chomping at the bit to write more. I am fine and recovered from having been so sick and have been very busy here in the Village. 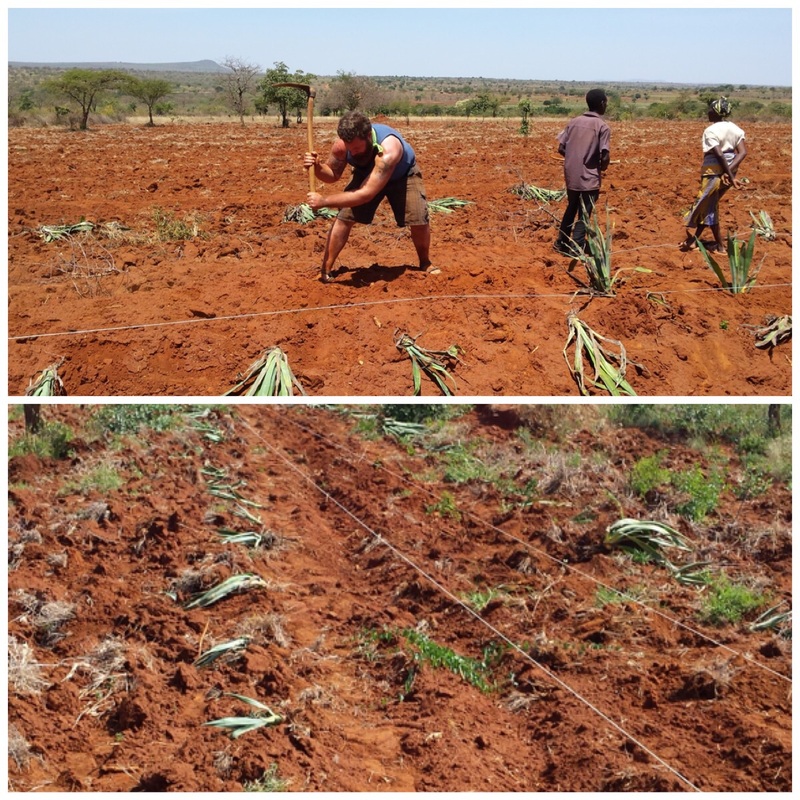 EVERYONE has been very busy working planting the sisal garden, teaching in the schools, counseling many clients and more. Lilian and I have been to every classroom to talk about grief and loss and to prepare the whole Village for the Day of Remembrance, the event to be held tonight. We have been getting all the luminaries together with children’s parents names and organizing all the details, rehearsing the songs and more. I hope that everything comes together as planned. It should be beautiful! Today is Brendan and Ryan’s birthday so I want to say Happy Birthday to Ryan and (I miss you) and Brendan, I miss you terribly, and this event is dedicated to you. I will write more and post many photos when I am back in touch with a regular internet connection. STAY posted, here’s a lot more to come! The days have been very busy as we have continued to meet with the self help groups involved in Tuko Pamoja in Dagoretti, Kawangare, and in the Maasai community. 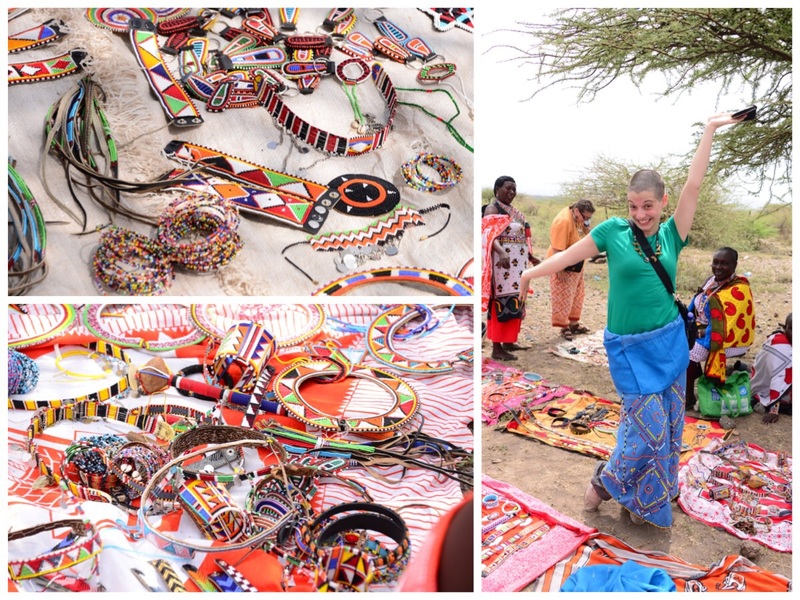 Our involvement and deepening connection to the Maasai community has evolved over time; not only do we meet with the women’s self-help group there, but we are also more and more integrated in the community. We were there on Tuesday and Thursday and although I sadly had to stay behind on Thursday because I was sick, I got an excellent good report about how the day went and people took pictures for me. 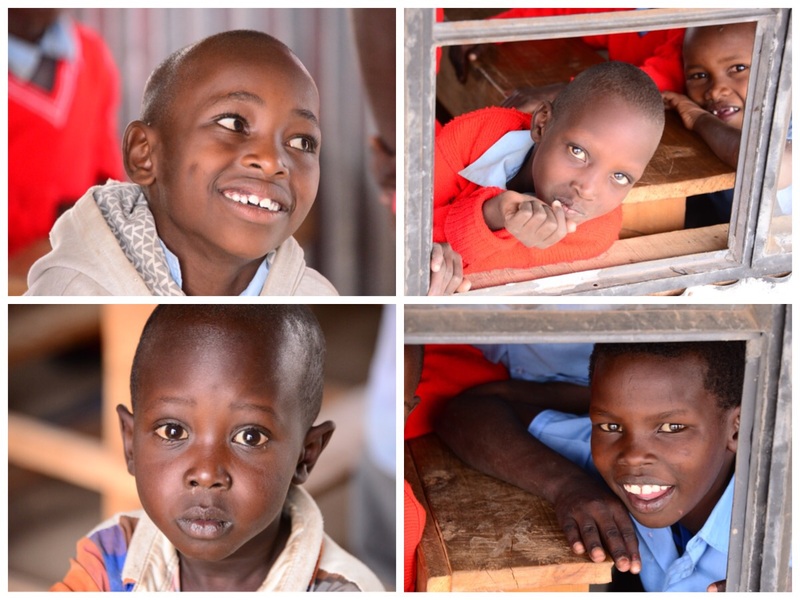 Always when we arrive at the Maasai school, the children are so excited to see us. They stand outside the classroom, having to be held back by their teachers because of their excitement. I can recall that our first year there, some of the children were a little frightened of us, being a whole group of white people, but that has changed and they are enthusiastically welcoming all around. We always have a division of labor with some volunteers teaching in the lower grades and this time others delivering backpacks to the upper grades to the children who didn’t get them last year. My job is always being the official photographer, a very lucky assignment since I just love to take pictures of their faces. 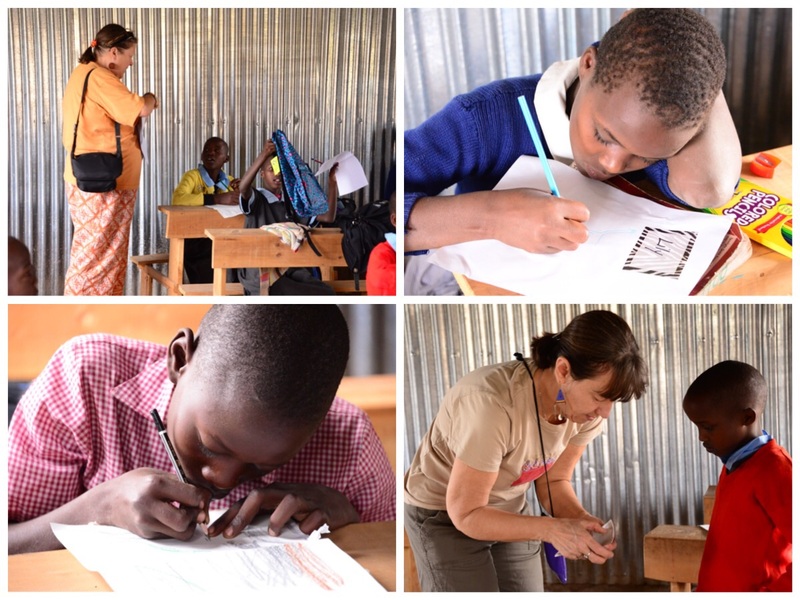 Among the activities done with the children are enrichment lessons focusing on telling stories or making crafts. This time the story was one that created a lot of opportunity for reading with drama and singing so a fun time was had by all. The older children were very excited to get new backpacks since they had never had them before. In each backpack was a letter from a child in the states so the children were writing letters in return. 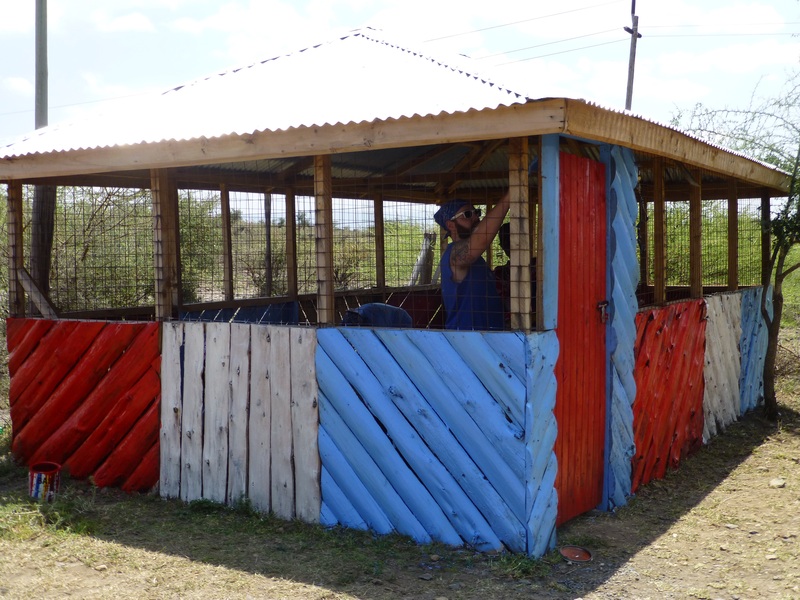 When we first began coming to the Maasai community they had just built their school and it was a pretty primitive structure. Now they have a much better building, and their teachers have done the required training allowing the school to become government certified. You may recall that last year we helped to fund the certification courses for the teachers. Now having completed this training, their teaching salaries are paid by the government rather than having to be paid by the community which was a huge struggle. We were surprised when we arrived this time to find government workers in the beginning phase of installing electricity in the school. So in just the few years that we have been going to that community a lot of progress has been made. After the teaching in the classrooms and distributing new backpacks, we had the opportunity for just good fun with the children. This included distributing bubbles and a very spirited game of red light green light which they absolutely loved. 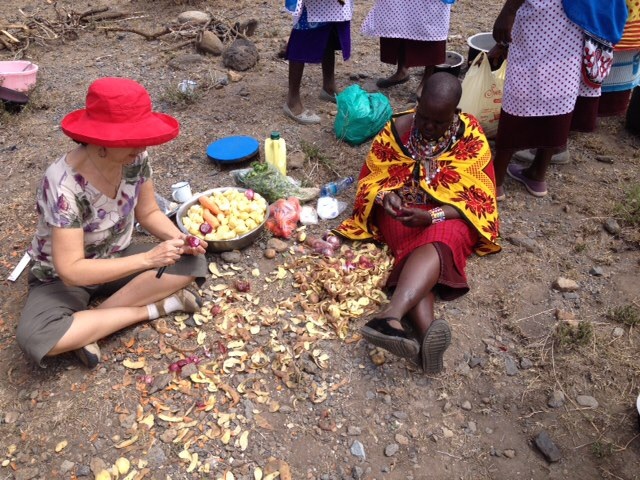 It was then lunchtime for them and time for us to meet with their Mommas–the women of Tuko Pamoja. However, new volunteers got to spend time in their homes helping them to do chores, talking together and holding babies of many varieties. 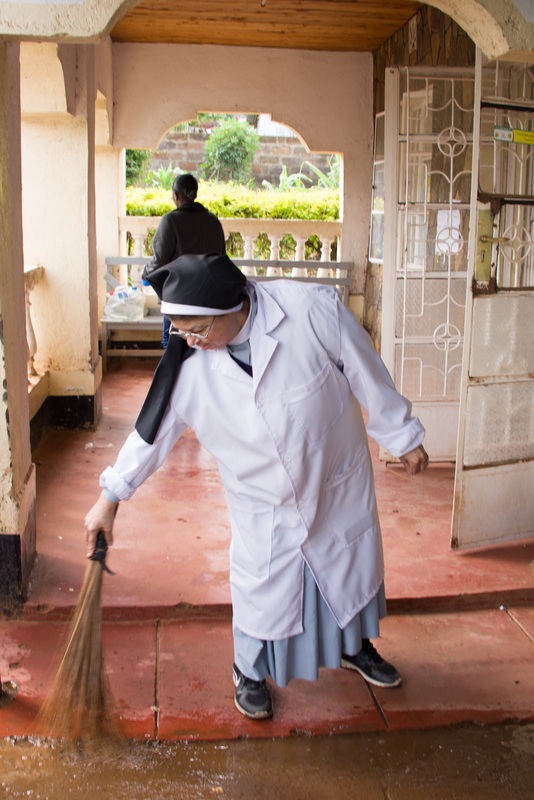 On Wednesday, we traveled to two different sites where women’s self-help group participate in Tuko Pamoja and based at the Lea Toto clinics in the slums of Nairobi. At both of these sites the new volunteers were involved with the work of the clinic and meeting with community health workers to learn more about what the programs offer to families of HIV+ children living in the slums, and learning more about the medical and social aspects of living with HIV. 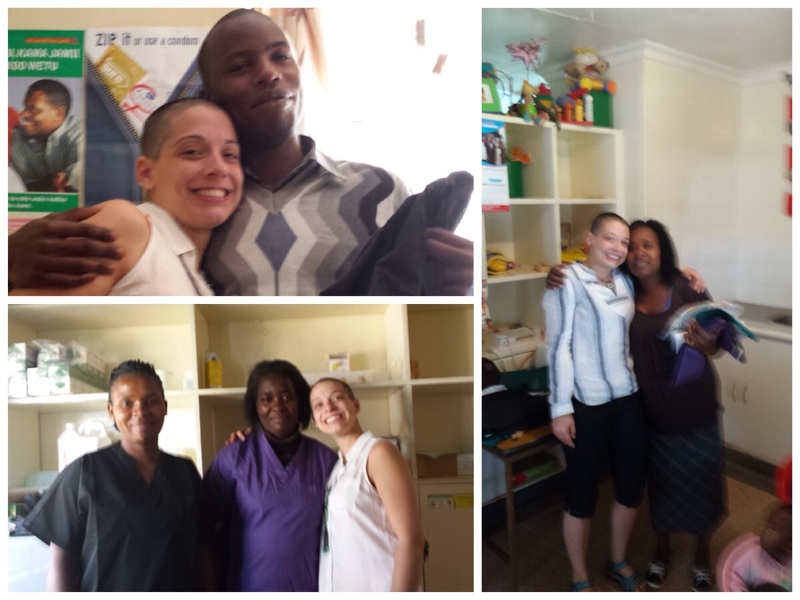 Judy and Valerie provided some additional counseling to several of the clinic clients. Sister Little who originally founded the first self-help group. We held the annual Tuko Pamoja meeting with each of the self-groups, in both Kawangare and Dagoretti with the Dagoretti group being new to Tuko Pamoja in the past year. Since we launched Tuko Pamoja in 2012, because it has been such a success that has become known to all of the self-help groups in Lea Toto, other groups want to become a part of it and we have added two new groups to make a total of eight. What I mean by success is that we are able to purchase the women’s crafts upfront at fair market value to sell in the US thus remarkably increasing their sales and allowing them to feed their families and to keep their children in school. Any extra profit comes back to the women in bonuses which they are overjoyed to receive. 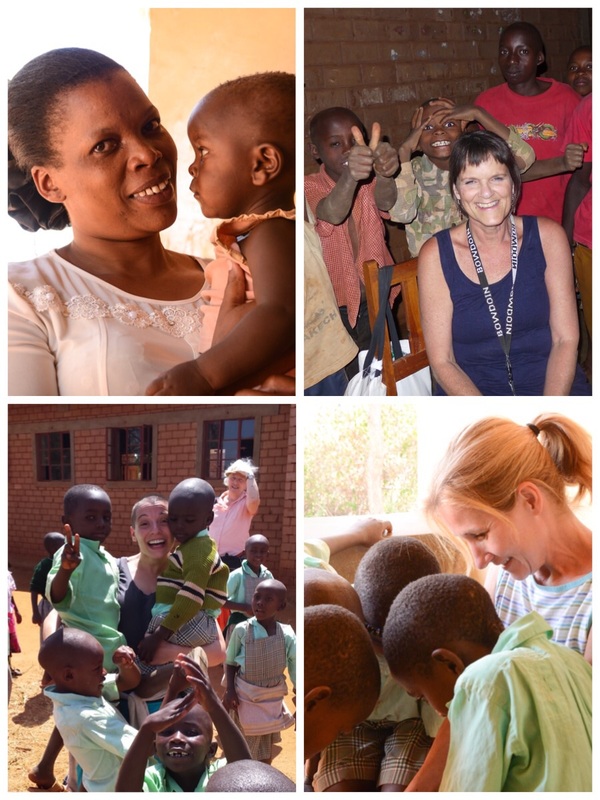 All of the women have incredible stories, many are themselves HIV+, and many are raising foster children in addition to their own children—all in extremely small and tight living quarters. In addition to giving the women bonuses, we collect scarves through the year and are able to give each woman a scarf and this time I was able to give each group that works with beads, a sizable donation of beads which elicited a lot of cheering and gratitude. (Thank you Jean and Rick!) As Tuko Pamoja has grown, Nyumbani has hired a director for the self-help groups and created two additional jobs for working with the self-help groups. We were remaking on our return drive home that not only has this been a great help to the women in so many ways, but the sparking of three new jobs has been a side benefit which we not have imagined when we initially set out to start this project. I have to give Lloydie so much credit for having the vision to create Tuko Pamoja. 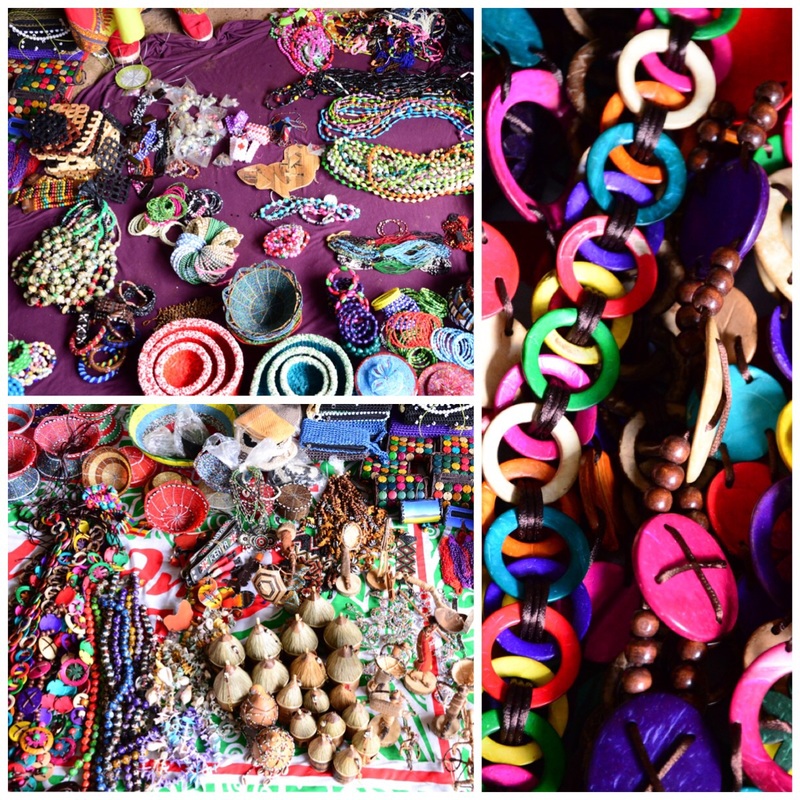 At both Dagoretti and Kawangare, like the other sites, I filmed demonstration videos, one of making a beaded bowl and one of paper beads. The return to PCDA on Thursday was both hard work and a lot of fun. 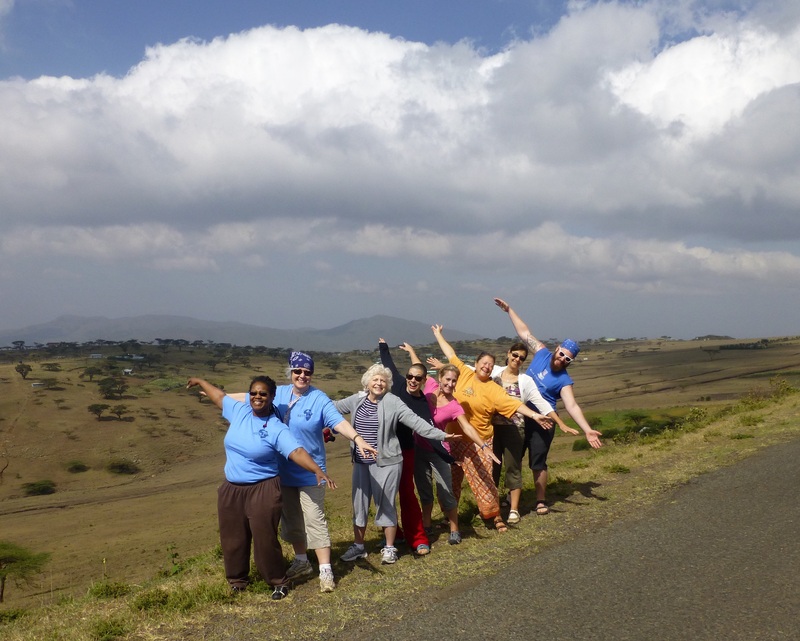 The drive to and from is through beautiful countryside along the Rift Valley and an annual stop for a group photo. I was very sad to miss it because I was too sick, but got a great report and lots of photos provided by the other volunteers. The biggest goal of the day was to paint the women’s workshop. Both of our visits to PCDA surprisingly have been blessed this year with a moderate heat and a very good breeze. This made painting with oil based paint in the sun much more tolerable. My job was to paint a sign for the shop which included the Tuko Pamoja logo, and because I wasn’t able to be there, the sign was returned here with just the background painted so I can hopefully work on it this weekend. 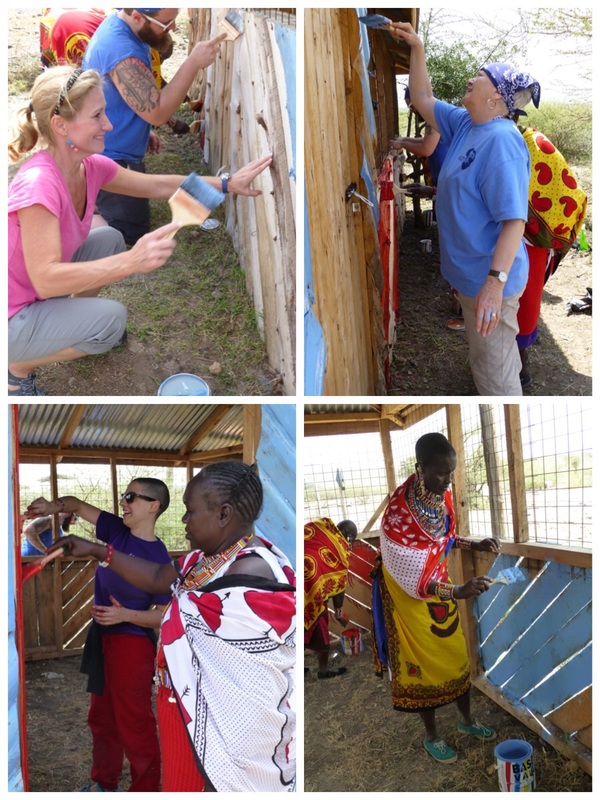 Most of the volunteers painted side by side with the Maasai women, but Deb and Valerie worked with them to help prepare a festive meal. 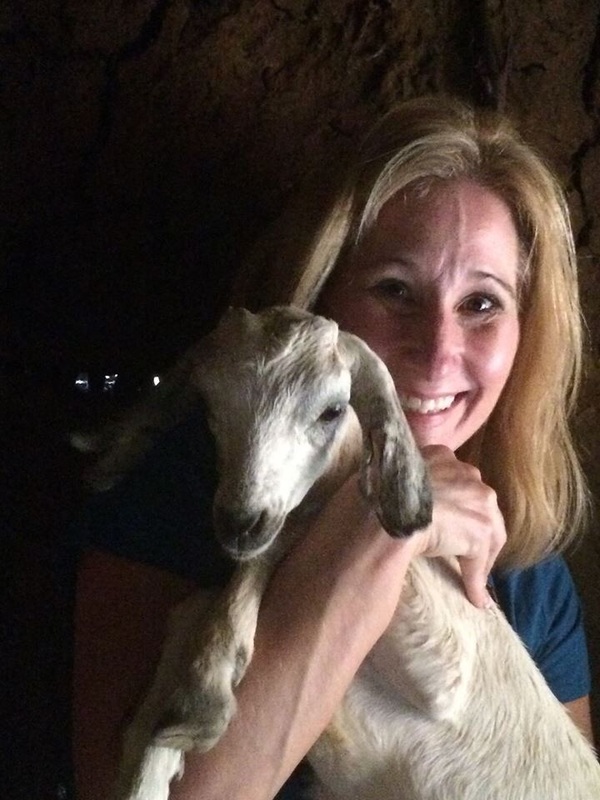 It is a tradition in Kenya when you really want to honor your guests that you sacrifice a goat and cook it for them. I wasn’t exactly disappointed to miss the goat, but I enjoyed hearing about the festivities and how much the women wanted to do something for us. They also gave all of the women volunteers a new leso. I will close this blog post with a very sweet story. Every year when we drive out to the Maasai community we travel the same roads. Every year we also see the same woman sitting in a wheelchair by the side of the road selling soap. Every year we wave to her and blow her kisses and she exuberantly waves back clearly recognizing us. We call her “the soap lady” since we’ve never know her name. 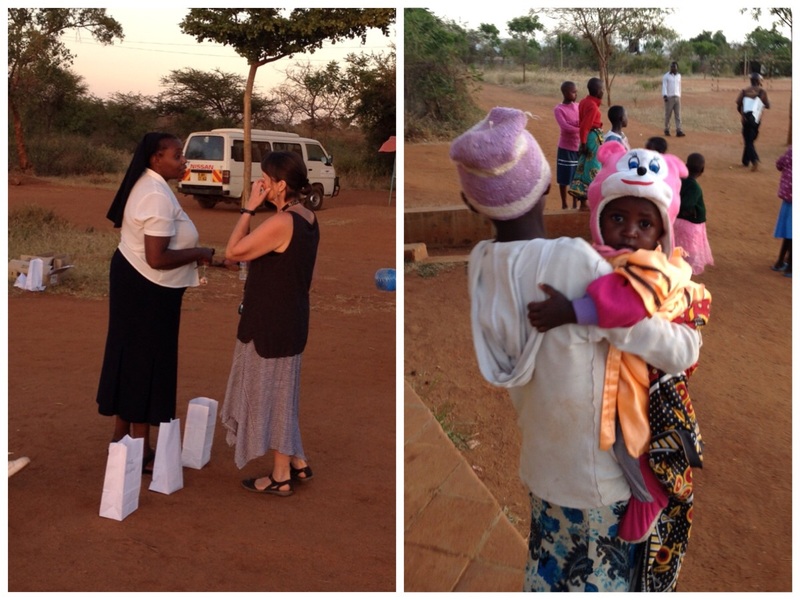 This year we decided that we would stop and meet her and give her a little gift of a scarf and a goodie bag. I’m so sorry that I missed this, but was very touched to hear the story. Deb and Lloydie got out of the car gave her the gift and she was, as you can see in the picture, completely overwhelmed to tears with this small act of kindness. We now know her name is Jane and are once again reminded how little it takes to make a difference in someone’s day.